That the Minutes of the Development Assessment Panel Meeting held on 28 November 2018 be confirmed. That the Minutes of the Development Assessment Panel Meeting held on 14 November 2018 be confirmed. 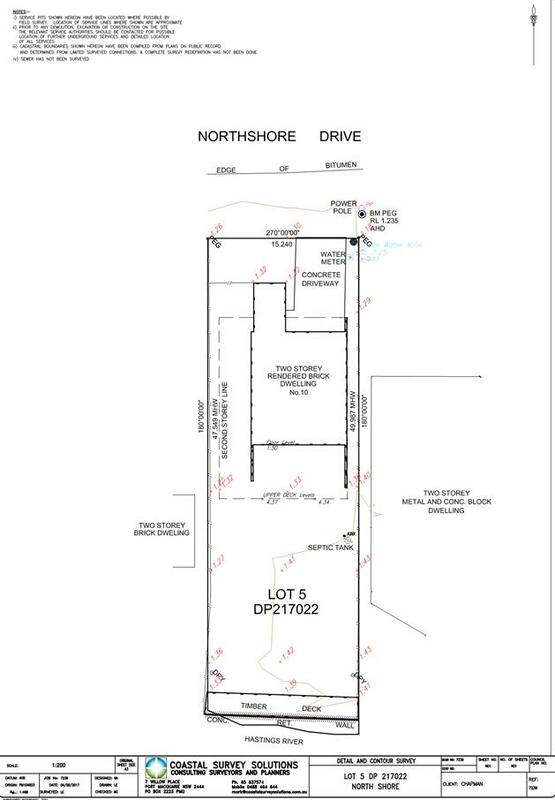 Item - 05 DA2017 - 736.1- Staged 198 Site Manufactured Home Estate With Associated Amenities And Infrastructure, And Modification To Previous Approved Subdivision (DA2006-57) - 79 Batar Creek Road, Kendall - has been moved to another part of the document and considered at 5:30pm. 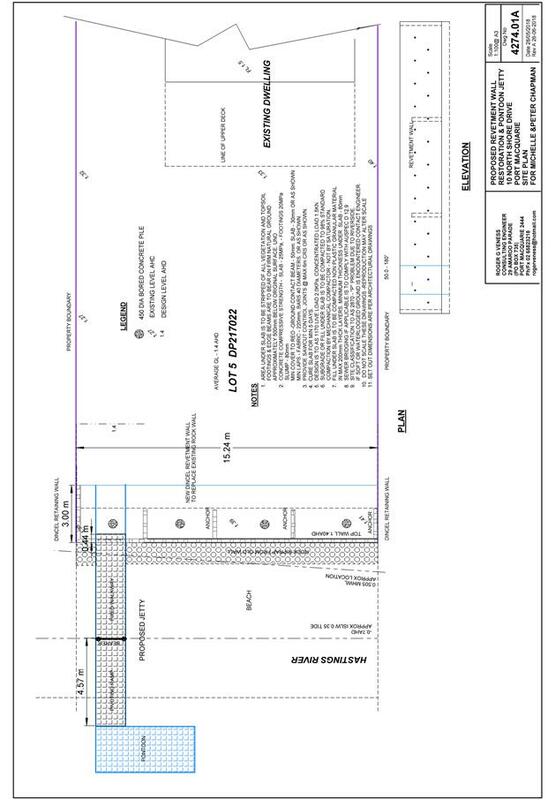 That DA 2018-790 for an Additional Dwelling to Create a Dual Occupancy and Strata Subdivision at Lot 130, DP 815514, No. 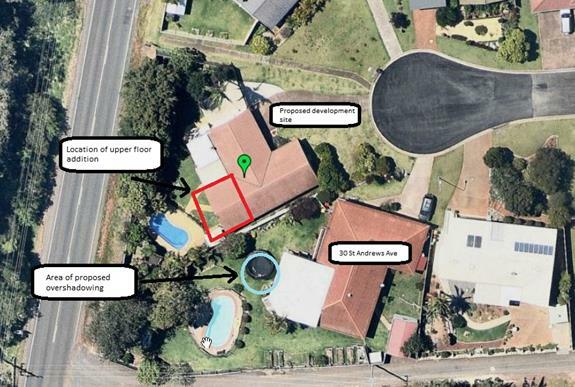 27 Grassmere Way, Port Macquarie, be determined by granting consent subject to the recommended conditions. 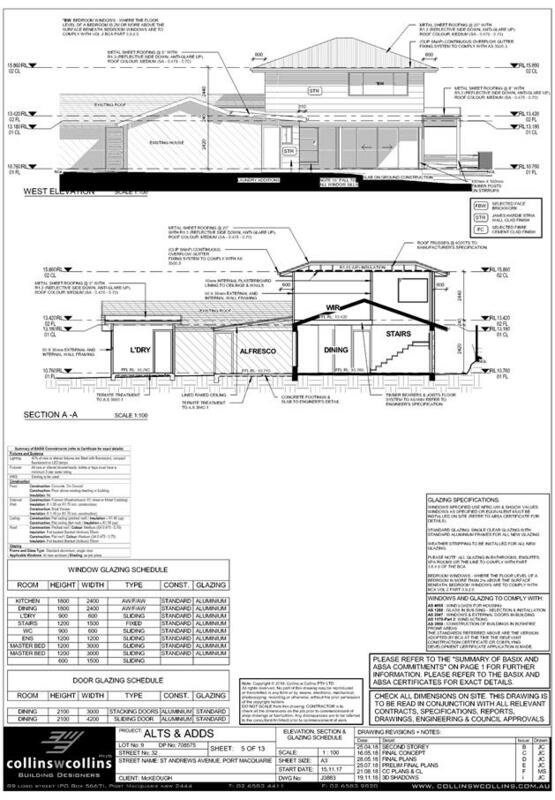 07 DA2018 - 778.1 Alterations And Additions To Dwelling - Lot 18, No. 8 Chepana Street, Lake Cathie. Submission from Michelle Chapman dated 27 November 2018 tabled at the meeting. 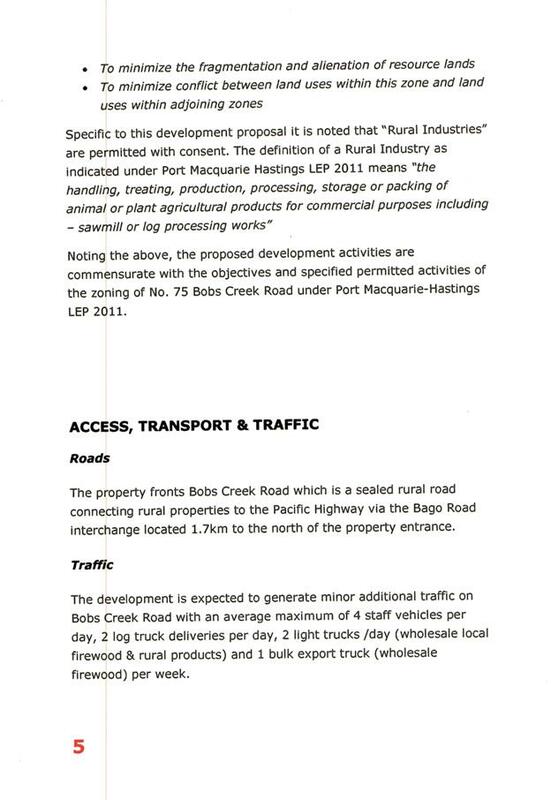 Additional condition in section B of the consent to read: ‘An application pursuant to Section 138 of the Roads Act, 1993 to carry out works required by the Development Consent on or within public road is to be submitted to and obtained from Port Macquarie-Hastings Council prior to release of the Construction Certificate. 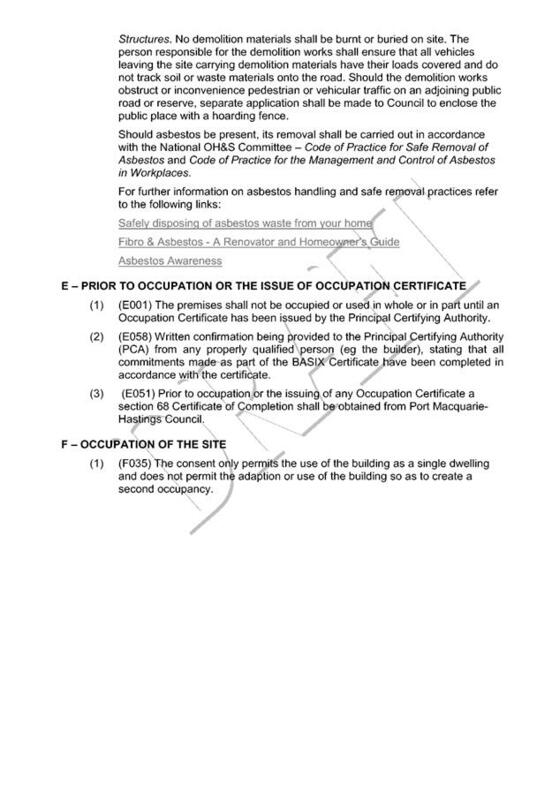 Additional condition in Section E of the consent to read: Prior to occupation or the issuing of the Occupation Certificate provision to the Principal Certifying Authority of documentation from Port Macquarie-Hastings Council being the local roads authority certifying that all matters required by the approval issued pursuant to Section 138 of the Roads Act have been satisfactorily completed. The Development Assessment Panel meeting adjourned at 2:17pm and reconvened at 5:30pm. The Social Impact Assessment submitted with the application prepared by All About Planning is to be referenced in the approved plans and documentation outlined in condition A(1). The meeting closed at 7:15pm. Subject: DA2018 - 759.1 Replacement Of Revetment Wall And Construction Of Pontoon - Lot 5 DP 217022, No, 10 North Shore Drive, North Shore. That DA2018 – 759.1 for the replacement of revetment wall and construction of pontoon at Lot 5 DP 217022 No.10 North Shore Drive, North Shore, be determined by granting consent subject to the recommended conditions. 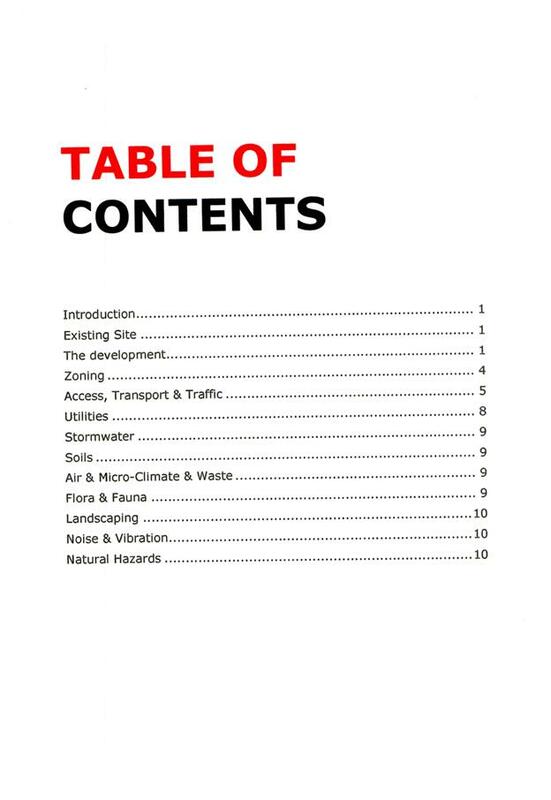 This report considers a development application for a [description of development] at the subject site and provides an assessment of the application in accordance with the Environmental Planning and Assessment Act 1979. Following exhibition of the application, 3 submissions have been received. The site has an area of 743.13m². · Replace deteriorated revetment wall along the river frontage and install new floating pontoon & walkway. · 18 September 2018- Application lodged. · 7 November 2018 - Site inspection. The proposal will be unlikely to have any adverse impact on existing aquaculture industries. Controlled activity approvals will be required from Department of Primary Industries and Office of Water. These approvals will need to be followed through the construction process to ensure there is no significant impact on the Hastings River environment. The the proposed development is compatible with the surrounding coastal and built environment. The site is predominately cleared and located within an existing nresidential area. 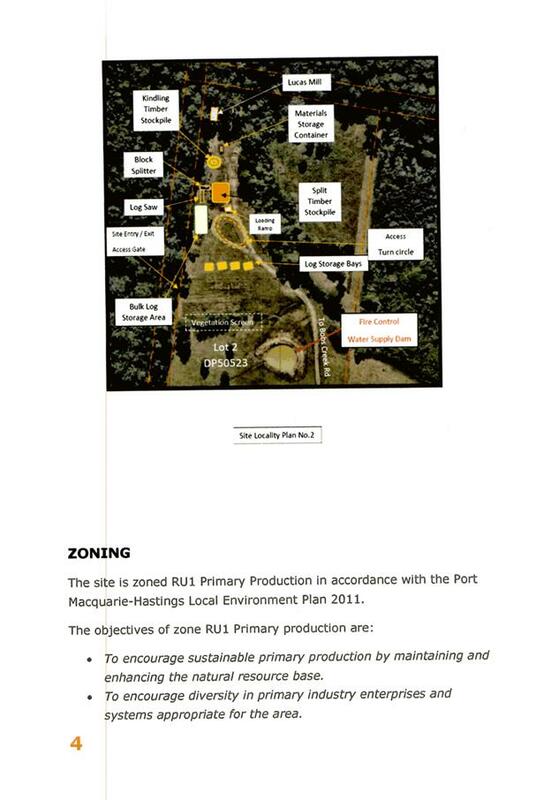 · Clause 2.2, the subject site is zoned RU1 Primary production General Residential. In accordance with clause 2.3(1) and the RU1 zone landuse table, the dwelling (or ancillary structure to a dwelling) is a permissible landuse with consent. § To encourage sustainable primary industry production by maintaining and enhancing the natural resource base. § To encourage diversity in primary industry enterprises and systems appropriate for the area. § To minimise the fragmentation and alienation of resource lands. § To minimise conflict between land uses within this zone and land uses within adjoining zones. · Clause 4.3, there is no maximum overall standard height limit applying to the site. · Clause 4.4, there is no maximum floor space ratio applying to the site. 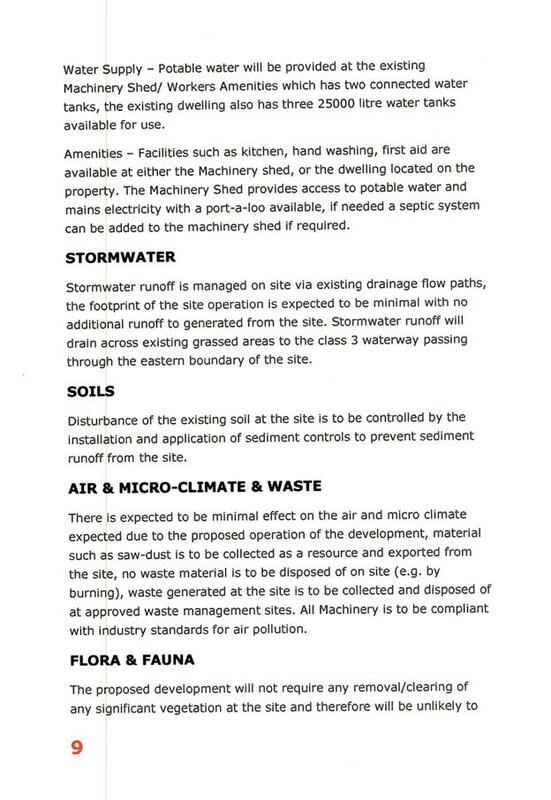 · Clause 7.1, the site is mapped as potentially containing class 3 acid sulphate soils. o Works more than 1 metre below the natural ground surface. o Works by which the watertable is likely to be lowered more than 1 metre below the natural ground surface. The proposed development includes 4 bored piles to a depth of 1.5m. Works are consistent with Councils Policy Acid Sulfate Soil Management Plan for Minor Works. No adverse impacts are expected to occur to the acid sulphate soils found on site. o The proposal is not likely to result in unsustainable social and economic costs to the community as a consequence of flooding. Walkway setback 1.0m from side boundary. 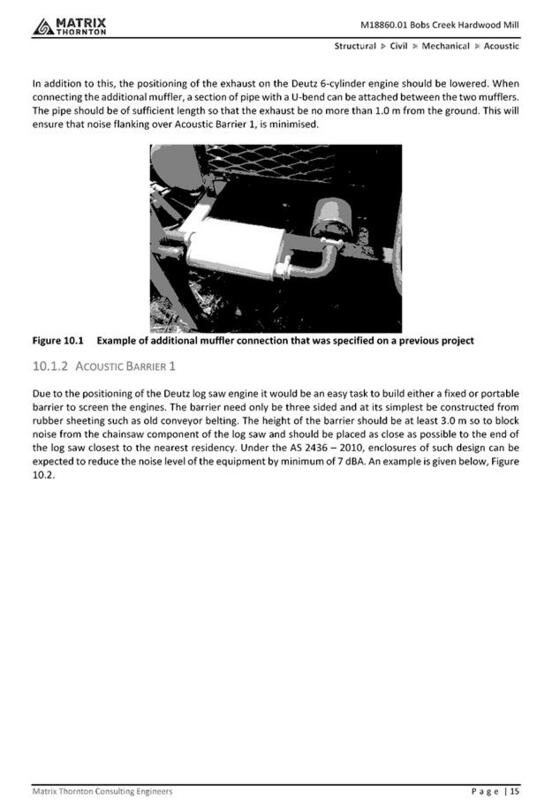 a) Mooring piles are to be set at a level no lower than the level which ensures that the floating structure is retained during the design 1:100 year flood event. b) The width of a jetty walkway not to exceed 1.0m. (1.0m proposed). c) The area of a platform should not exceed 10m². 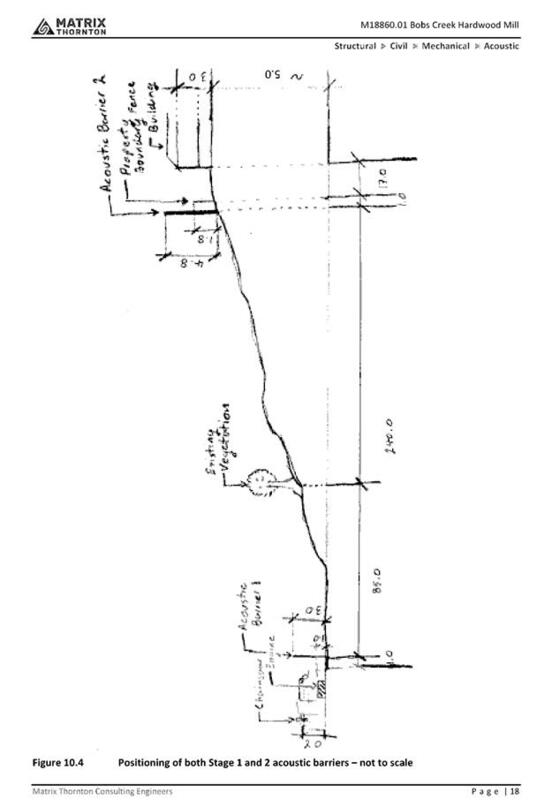 d) Jetty length measured from the existing revetment wall not to exceed 17m. e) Boating ramps should have a maximum overall width of 3.0 metres and a maximum overall length of 10.0 metres. f) Pontoons moored at right angles to the revetment wall not to extend 17 metres from the wall. h) Fixed jetties may only extend to a point 7m from the revetment wall. i) Any extension beyond a point 7m from the revetment wall is to be by way of a pivoting walkway to a floating pontoon. j) The deck of the jetty is to be above and not resting on the revetment wall and the top surface is not to be above RL 1.4m AHD. k) Pontoons moored parallel to the revetment wall not to extend beyond a point 12 metres. (12m proposed). l) Floating moorings should be located between 17m from the revetment wall. m) Fixed mooring poles should not be greater than 17m from the revetment wall. No adverse impact anticipated. Standard construction methodologies capable for completing the works. 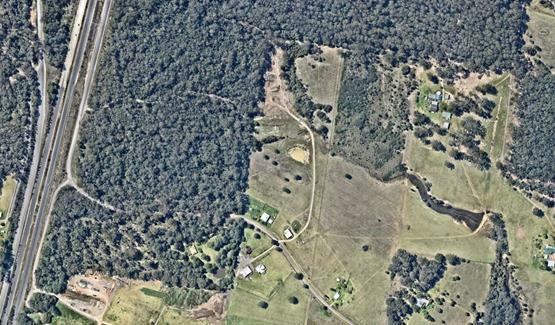 The site is identified as being partially bushfire prone. 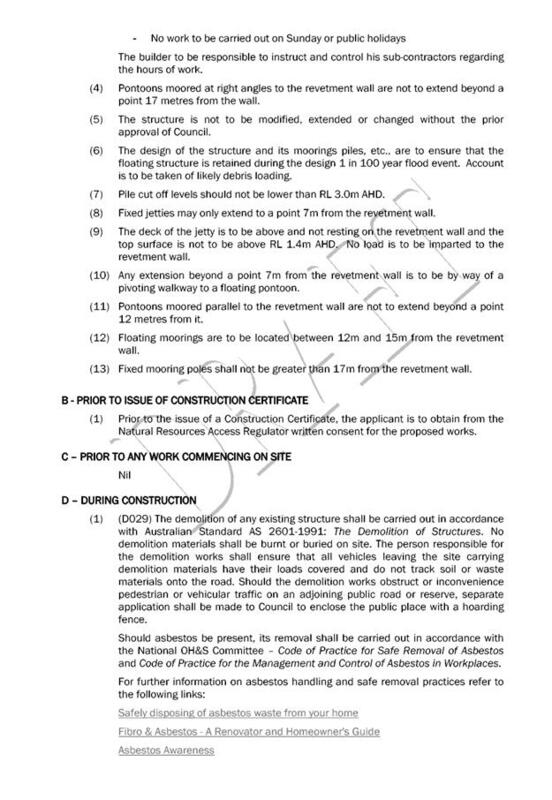 No construction requirements under AS3959- 2009 are applicable to the proposed works. Site constraints of bushfire/flooding have been adequately addressed and appropriate conditions of consent recommended. 3 written submissions have been received following public exhibition of the application. Pontoon does not suit the surrounding environment & will be out of place. The pontoon & walkway is consistent with other similar structures to the east of the subject lot. The length of the walkway is excessive & will be a hazard at night. The walkway length is consistent with the maximum length specified in the Development Control Plan. The pontoon is not suited to a river especially during flood times. The pontoon is engineer certified to withstand flood forces at the 1:100 year flood event. Further environmental assessments are not considered necessary. The relevant State Government authorities have granted consent and imposed conditions of approval. The proposed walkway and pontoon does not restrict the use of the river. During flood & heavy rain, debris, logs, oyster racks etc. will get caught up on the western part of the pontoon. Debris will block neigbouring walls & boat ramps. The effect of debris during river flows cannot be anticipated. 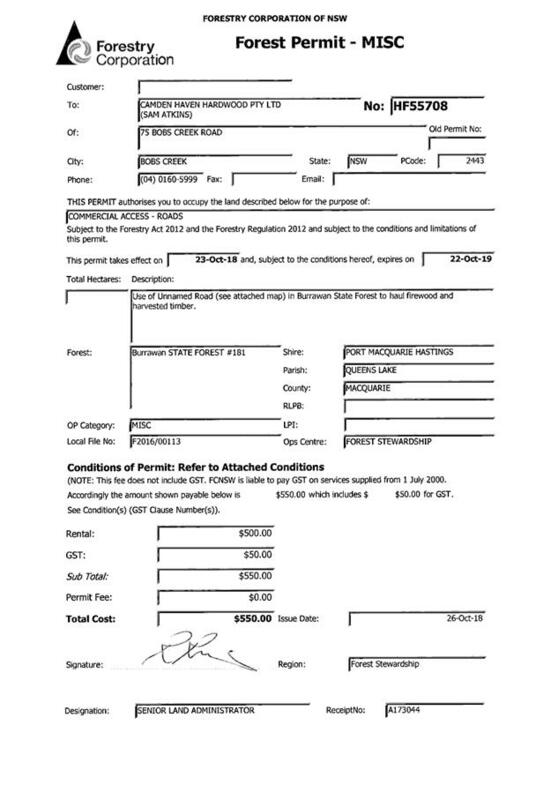 That DA2018 – 735.1 for alterations and additions to dwelling at Lot 9 DP708575, No. 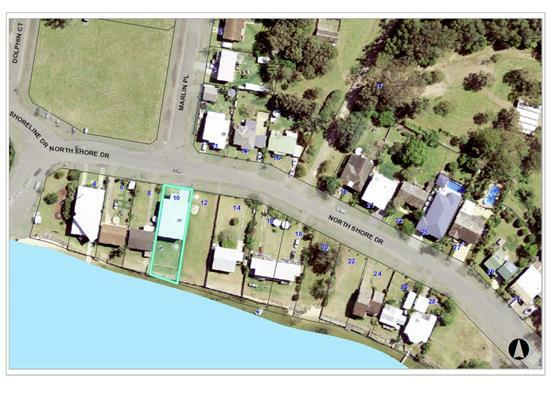 32 St Andrews Avenue, Port Macquarie be determined by granting consent subject to the recommended conditions. Following exhibition of the application, four (4) submissions has been received, from the one objector. St Andrews Ave is a residential street containing one and two storey dwellings. The subject site has an area of 990.200m2. 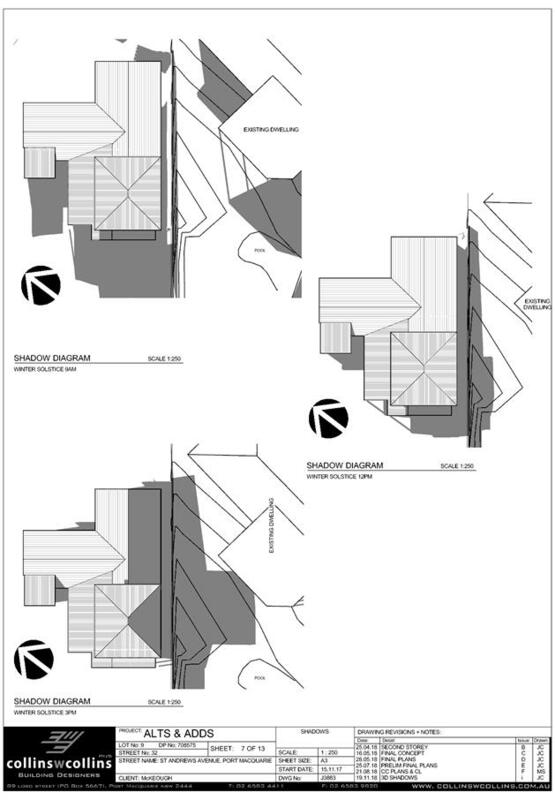 · An upper floor addition to a rear section of the existing dwelling, adjacent to the southern lot boundary. · The removal of a ground floor store room. The site is located within on land within a proximity area for coastal wetlands and within a coastal use and coastal environment area. (b) the quantity and quality of surface and ground water flows to and from the adjacent coastal wetland. The bulk, scale and size of the proposed development is compatible with the surrounding coastal and built environment. The site is cleared and located within an area zoned for residential purposes. 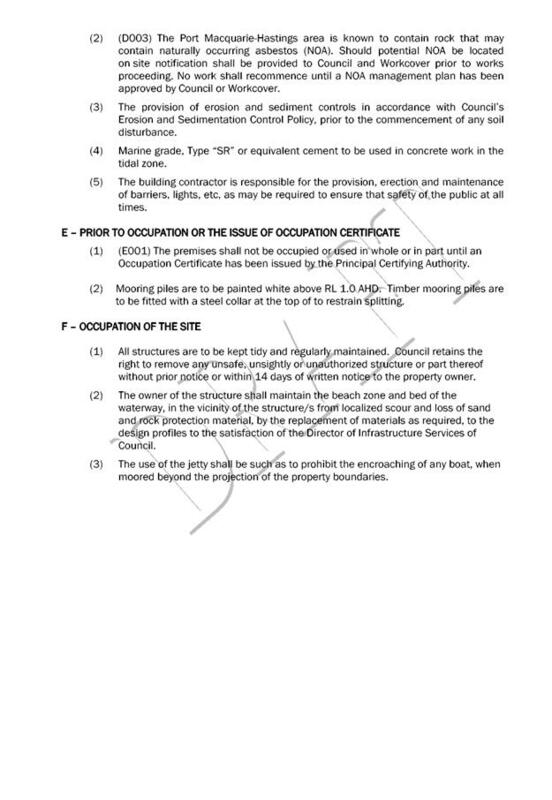 · Clause 4.3, the maximum overall height of the building above ground level (existing) is 6.861 m which complies with the standard height limit of 11.5 m applying to the site. · Clause 4.4, the floor space ratio of the proposal is 26.6:1.0 which complies with the maximum 1.0:1 floor space ratio applying to the site. 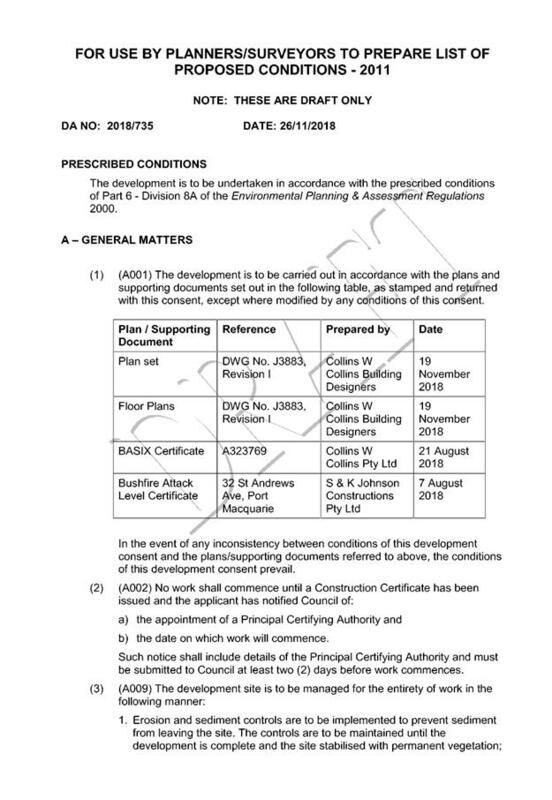 · Clause 7.1, the site is not mapped as potentially containing acid sulfate soils. · Clause 7.3, the site is not land within a mapped “flood planning area” (Land subject to flood discharge of 1:100 annual recurrence interval flood event (plus the applicable climate change allowance and relevant freeboard). 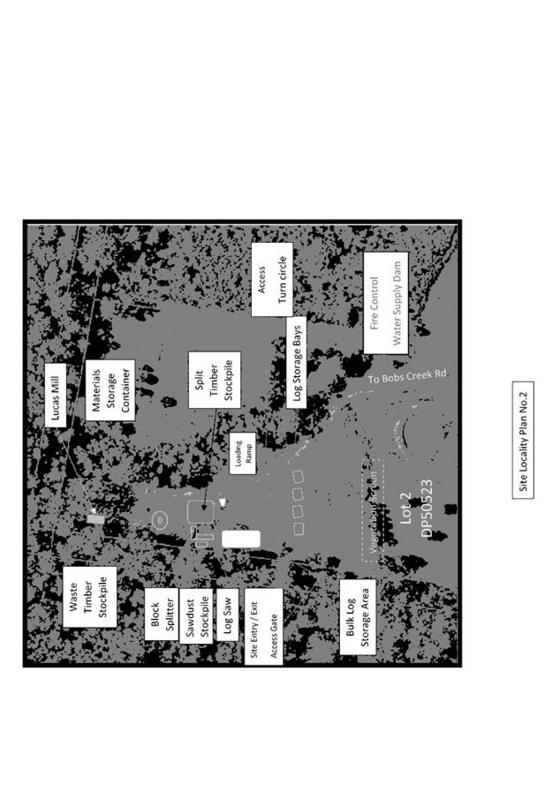 · Clause 7.5 – Site is not mapped as containing Koala Habitat. 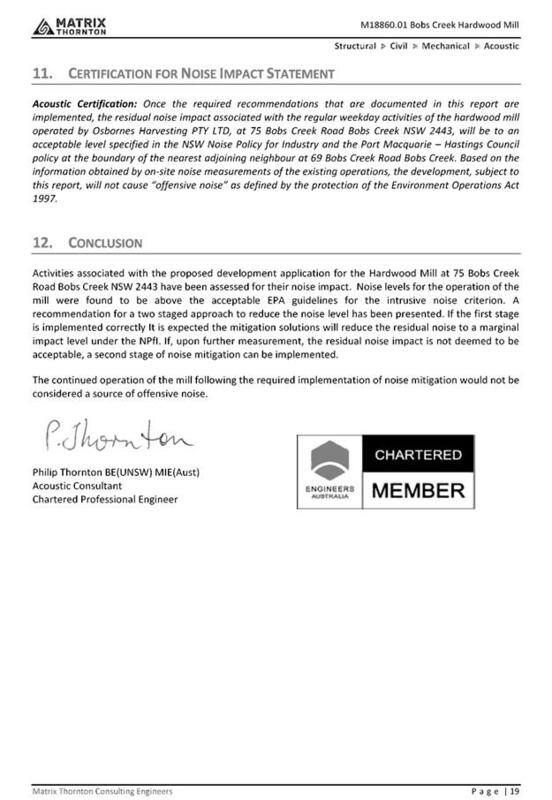 · Clause 7.8 - Development in areas subject to aircraft noise – site not located within an ANEF contour of 20 or greater. 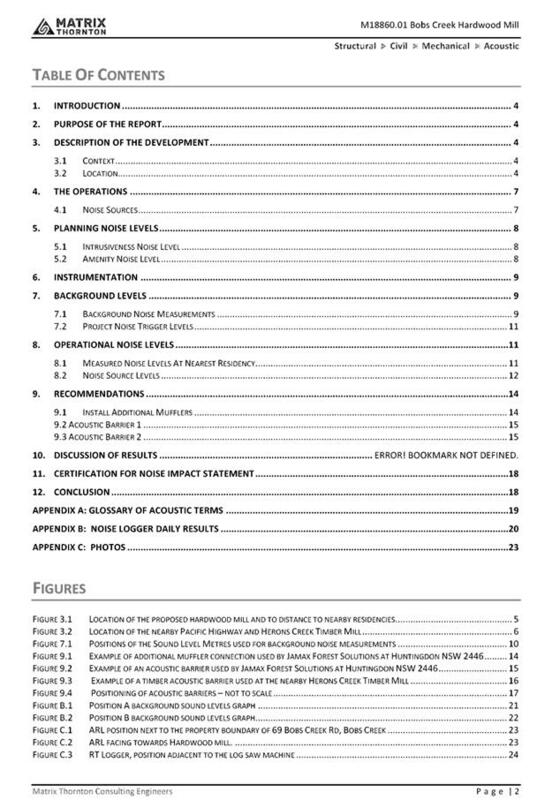 · Clause 7.9 - Development subject to acoustic controls – site not identified as being subject to acoustic controls. All proposed development behind the building line and greater than 6m from Ocean Drive. 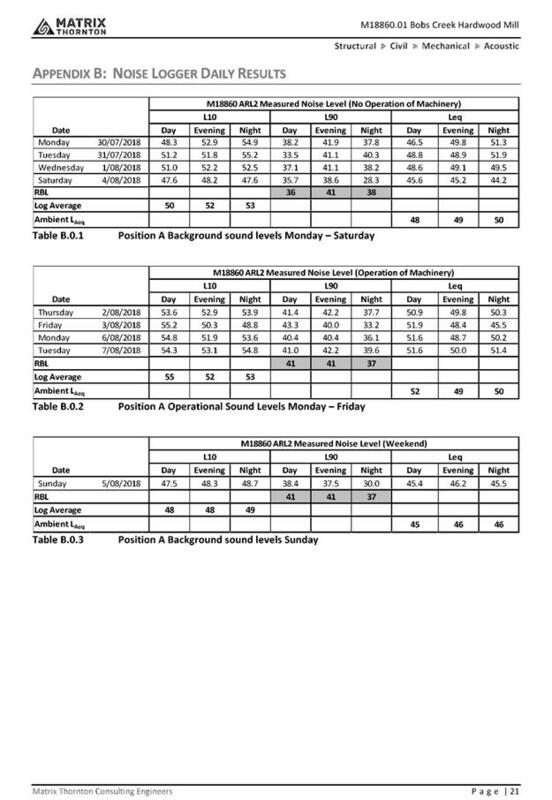 No changes to existing proposed. The minimum ground floor side setback requirements are complied with. 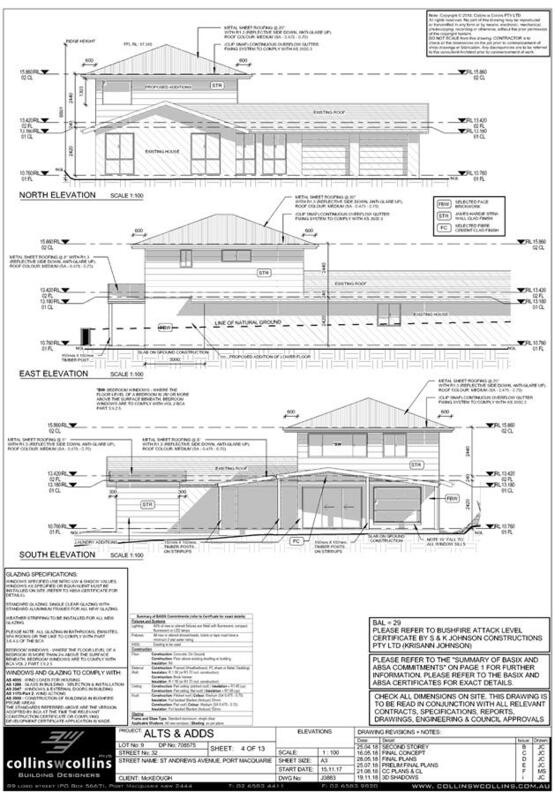 Upper floor addition proposed to be setback 1.942m from the southern lot boundary (labelled eastern elevation plan). The ground floor 3m addition to the south-west would result in an unarticulated building wall length of approximately 20m to the southern wall. The upper floor addition is not proposed to contain primary indoor living areas. Windows proposed on the eastern elevation plan are a high sill 0.6m x 0.9m (height x width) window and 0.9m x 0.6m wet area window. Upper floor windows proposed on the northern and southern elevations will not provide direct views (directly overlook with normal use of the room) to the primary indoor living area or primary outdoor space of an adjoining property. 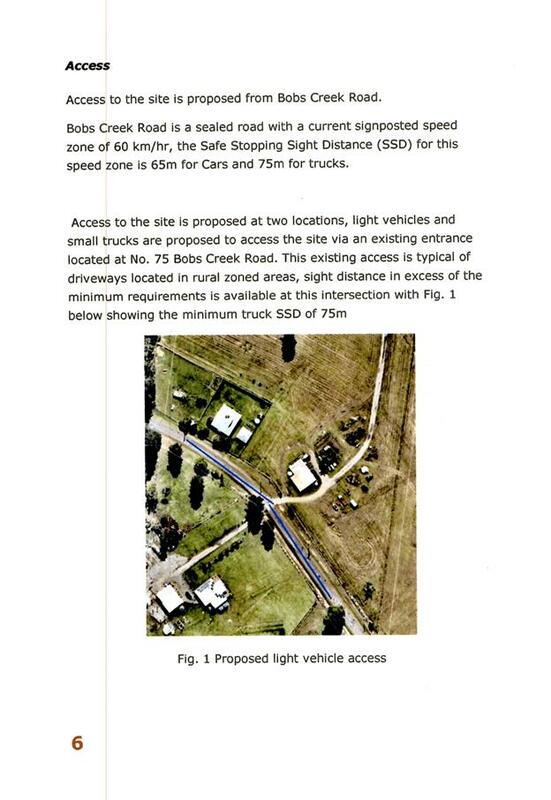 Existing driveway crossing considered suitable. Existing single dwelling only with 1 domestic driveway. No alterations considered necessary. Existing single dwelling only with 1 domestic driveway. Stormwater drainage is currently being managed adequately. The proposal seeks to vary Development Provision 3.2.2.5 relating to ground floor building walls being unarticulated for greater than 12m (approx. 20m) and the upper floor side setback of less than 3m (1.942m). o The existing wall extends for approximately 17m without articulation, and a 3m extension of the subject wall is proposed. o The site of the proposed development is significantly lower than the existing dwelling and land to the south (30 St Andrews Ave). 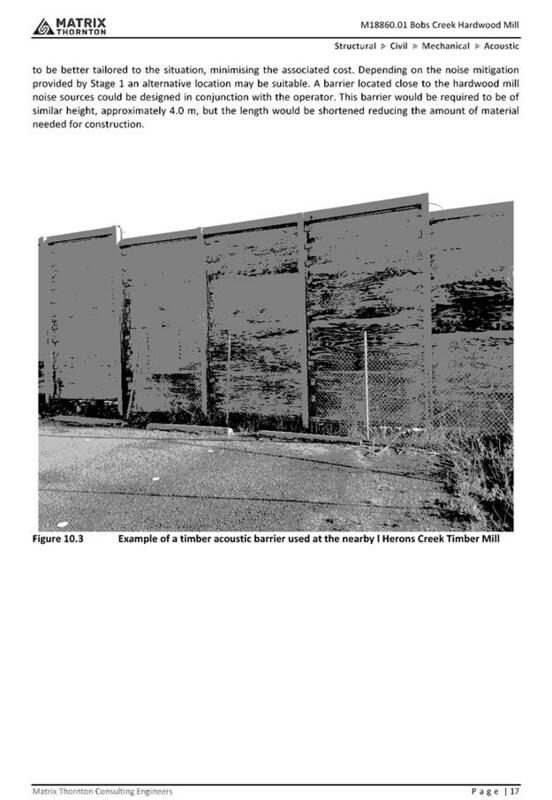 o There is an existing sheet metal dividing fence along the subject common boundary. Given the above considerations, it is not considered that the proposed additions to the ground floor, resulting in an unarticulated wall of approximately 20m, will create a feeling of overbearing or perceptions of building bulk from the property to the south (30 St Andrews Ave). o The floor level of the proposed upper floor addition is of a similar height to that of the primary outdoor living area of dwelling to the south (no 30 St Andrews Ave). See page 11 of the plan set. 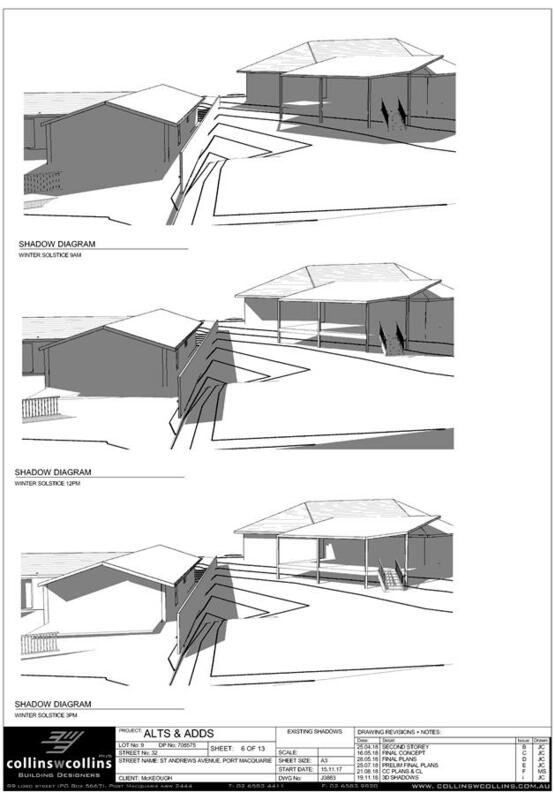 o The proposed addition is to have a physical separation of 7.8m from the dwelling to the south (30 St Andrews Ave). See page 11 of the plan set. 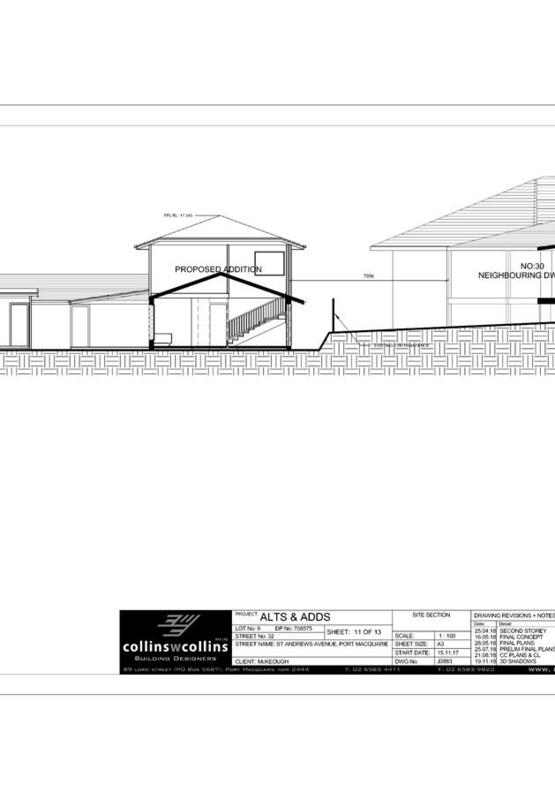 o The proposed upper floor addition is to extend a length of 7.990m along the southern lot boundary. o Upper floor windows adjoining the southern lot boundary (labelled as east elevation on plan) are not within living rooms. One window with dimensions 0.6m x 1.5m (height x width) has a minimum sill height of 1.5m, and the other window with dimensions of 0.9 x 0.6m, is proposed to be located within a wet area. o There will be additional overshadowing caused to a section of grassed area of the property to the south (30 St Andrews Ave). Given the above observations, and the residential context, it is not considered that the proposed upper floor addition will feel unacceptably overbearing or unacceptably bulky when considered from the property to the south. The window placement on the eastern elevation labelled plans will ensure that visual privacy is maintained to the primary outdoor living area to the dwelling to the south. The physical separation between the dwellings, combined with the proposed use of the rooms adjoining the lot boundary, will maintain an adequate level of acoustic privacy between dwellings. The upper floor addition, proposed to be setback 1.942m from the side lot boundary will result in some overshadowing to the land to the south, which is explored in more detail below. o The proposed development will result in additional overshadowing on the land to the south (30 St Andrews Ave). 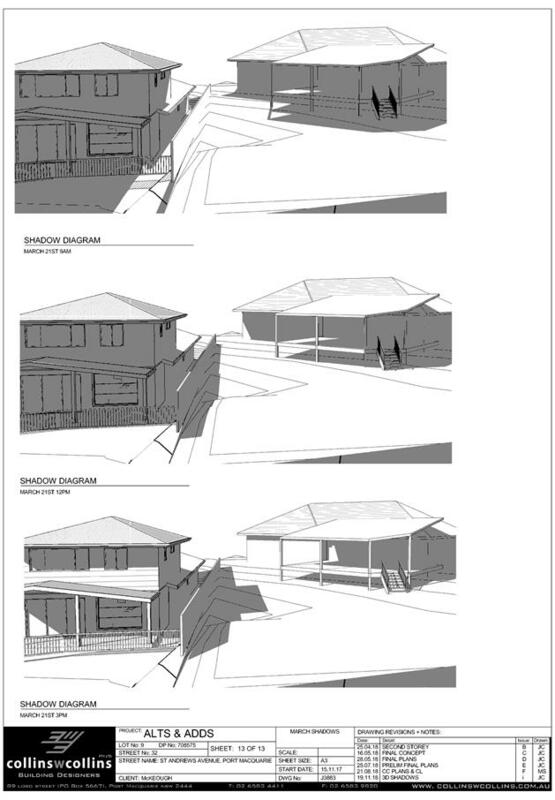 The overshadowing will occur in a section of land to the north-west of an existing covered deck. 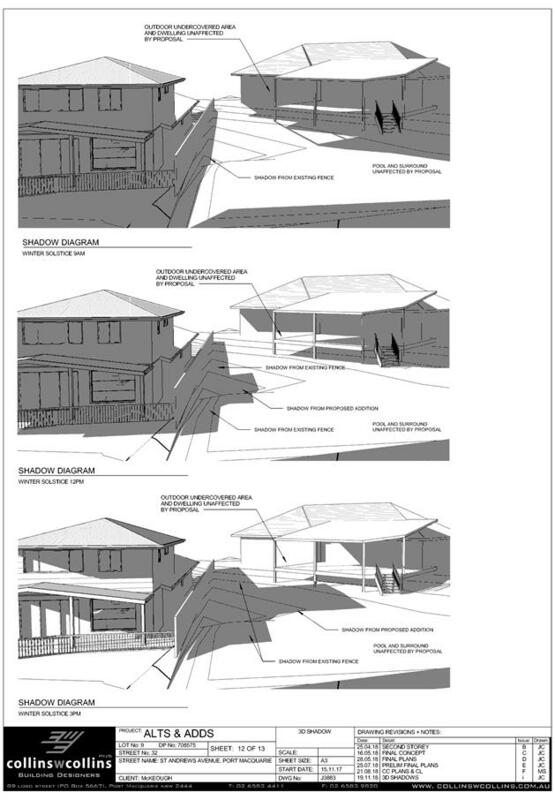 o The extent of the overshadowing is shown in the plans accompanying the application. Page 4 shows an isometric projection of the existing development only on 21 June. 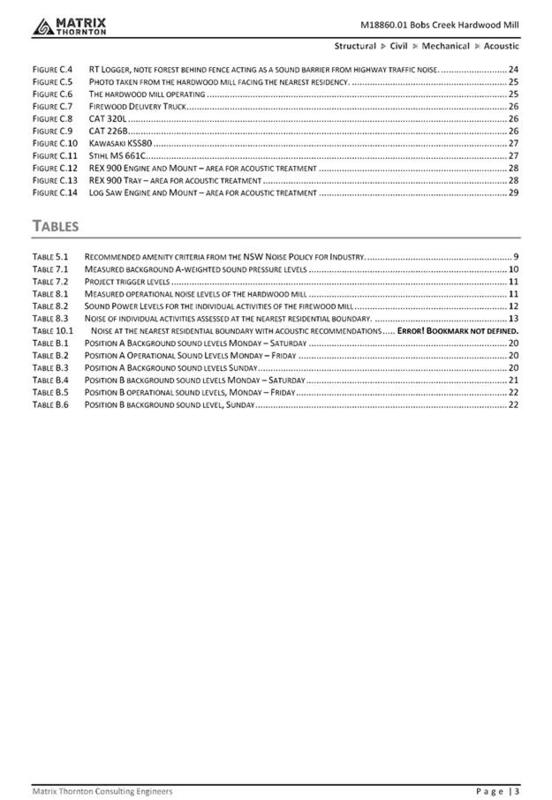 Pages 5 and 12 shows a plan and isometric projection of the proposed development on the 21 June. Page 13 shows an isometric projection on 21 March. o The plans show that no adjoining living areas will be over shadowed as a result of the proposed development. o The plans show that the deck area of the dwelling to the south (30 St Andrews Ave) will not be overshadowed as a result of the development. o Open space areas located on the property to the south (30 St Andrews Ave) exist, relative to the covered deck area, are to the; north, north-west, west area, along the southern lot boundary and a section along the eastern lot boundary. 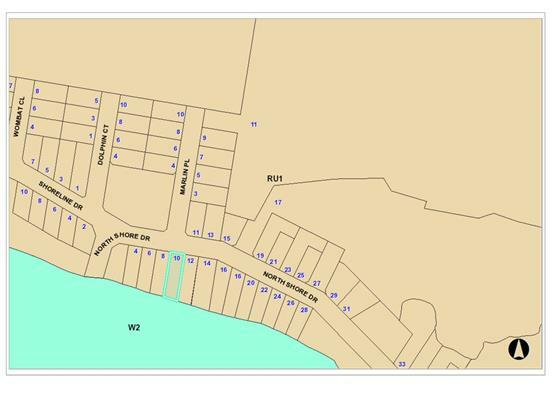 o The area which would be overshadowed as a result of the proposed development is an area to the north-west of the existing deck at 30 St Andrews Ave. Other areas identified in the point above will not be overshadowed as a result of the proposed development. o It is noted that some of the areas of open space listed above, at 30 St Andrew Ave, will be overshadowed at different times of the day from the existing dwelling at 30 St Andrews Ave. The proposed upper floor addition will result in overshadowing impacts to an area of open space to the north-west of the existing deck at 30 St Andrews Ave. 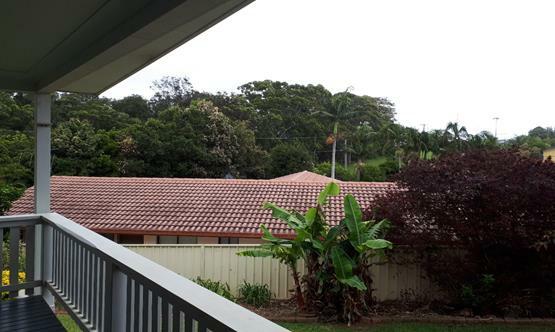 It is noted that the impacted lot is quite large and has a number of grassed outdoor areas, most of which directly adjoin a large covered deck which is considered the principal outdoor living area. These open space areas are all behind the building line and screened from adjoining residential land by boundary fencing. Accordingly, given the availability of a variety of private open space areas available at 30 St Andrew Ave, the period of time within the year when there will be an overshadowing impact and the 11.5m max building height, it is considered that the overshadowing impact is not considered unacceptable given the site circumstances. Based on the above assessment, the variations proposed to the provisions of the DCP are considered acceptable and the relevant objectives have been satisfied. Cumulatively, the variations do not amount to an unacceptable impact that would justify refusal of the application. With regard to view impacts, there will be some interruption to a view of trees along Ocean Drive to the north-west from the covered deck area of 30 St Andrew Ave. The view proposed to be interrupted is across a side boundary and will not be for the entirety of the northern lot boundary. 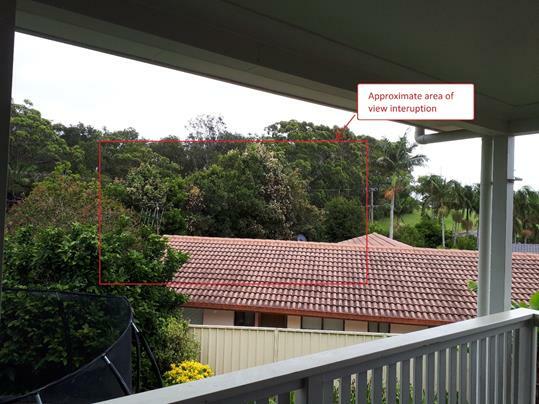 There will no impact to a view of trees along Ocean Drive over the western rear boundary, or of the Port Macquarie Golf Course over the rear southern lot boundary. 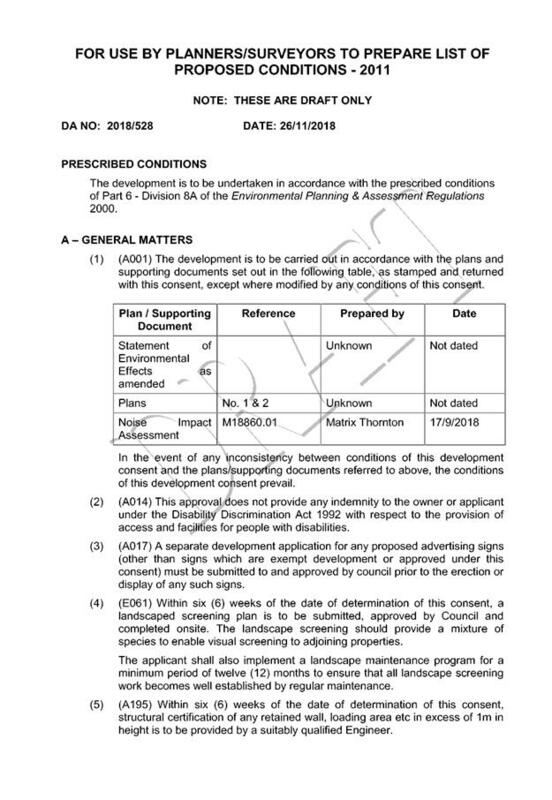 The interruption of a view to the north-west of the affected property would occur as a result of a non-compliance with a development provision of the Development Control Plan, however the extent of the view loss is not considered unreasonable given the site circumstances. There are no significant adverse privacy impacts to primary living areas or primary private open space areas due to the proposed orientation of windows, high window sill design to the southern elevation and proposed use of the rooms containing windows. There would be some overshadowing impacts resulting from the proposed development however due to the limited size of the area to be affected, for a limited period of the year the extent of overshadowing is not considered unreasonable. The proposal will be unlikely to have any unacceptable impacts to the existing adjoining properties and satisfactorily addresses the public domain. An assessment of bushfire risk having regard to section 4.3.5 of Planning for Bushfire Protection 2006 including vegetation classification and slope concludes that a Bushfire Attack Level 29 shall be required and that some upgrading of the existing dwelling is recommended. The proposed development design adequately responds to the site attributes and will result in a section of the dwelling being double storey, which will fit into the locality. The internal design, with no primary living areas proposed on the upper floor, assists to minimise potential impacts. Site constraints of bushfire risk have been adequately addressed and appropriate conditions of consent recommended. Four (4) submissions have been received following public exhibition of the application. Overshadowing to a section of the backyard. Proposed development will result in overshadowing to a section of the backyard of an adjoining property, particularly during the winter months however the extent of overshadowing is not considered unacceptable. See assessment earlier in this report. View and ‘atmosphere’ impacts from primary indoor and outdoor areas. Proposed development will have an impact on a view from the subject areas however view to be interrupted is not considered unacceptable given the circumstances. See assessment earlier in this report. Potential impacts to the ‘atmosphere’ of the subject areas are not considered significant due to the relative height of the proposed development, window placement and the proposed use of the rooms on the upper floor addition. Privacy impacts including ‘overlooking’ of a swimming pool and backyard and ‘direct views’ into primary indoor living and covered deck area. Upper floor windows proposed on the northern and southern elevation plans are orientated to the front and rear of the subject lot respectively. Normal use of the rooms containing these windows is unlikely to cause unacceptably ‘overlooking’ of the yard and pool areas. There are two windows proposed on the eastern elevation which are orientated to the primary indoor living and covered deck area of 30 St Andrews Ave. As identified in the assessment above, neither of the rooms is proposed to contain primary indoor living areas. One of the windows has a sill height of a minimum of 1.5m above floor level and the other window is proposed to contain a wet area. The high sill window is unlikely to result in adverse privacy impacts and it is proposed to impose a condition that the wet area window contain obscured glass. 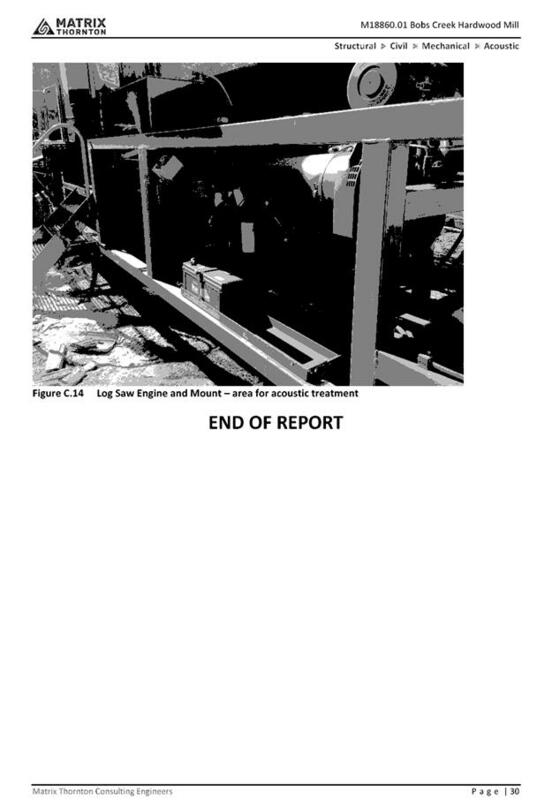 That DA 2018 – 528.1 for a log processing works (rural industry) at Lot 2, DP 505234, No. 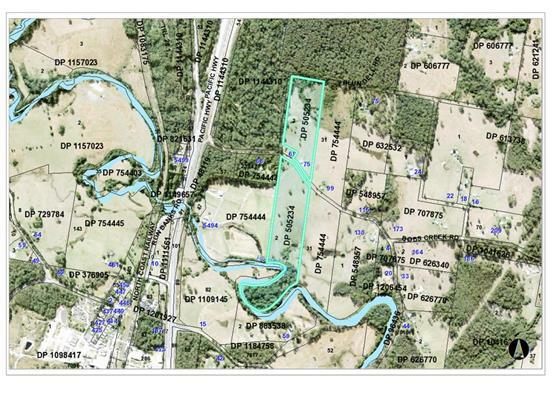 75 Bobs Creek Road, Bobs Creek, be determined by granting consent subject to the recommended conditions. 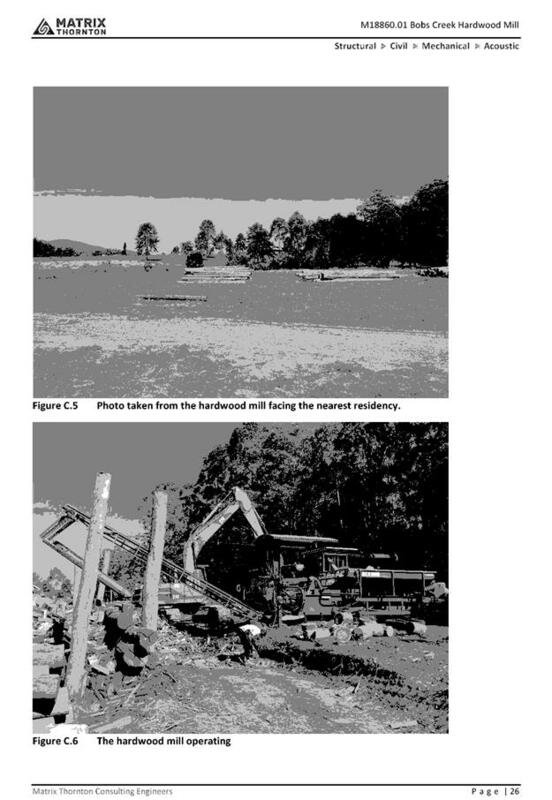 This report considers a development application for log processing works at the subject site and provides an assessment of the application in accordance with the Environmental Planning and Assessment Act 1979. Following exhibition of the application and prior to finalising this report, ten (10) submissions were received. The submissions comprise two (2) against the proposal and eight (8) in support of the proposal. The site has an area of 19.92ha. · A log processing mill is to be established for the purposes of processing timber into firewood and timber fencing. · Hours of operation (including vehicles picking up and delivering product) are proposed to be 7:30am to 4:00pm Monday to Friday and 8:00am to 1:00pm Saturdays. · Maximum of four (4) staff operating the mill. · 3000-4000 tonnes (approx 4600m³) to be processed per year with less than 1000 tonnes to be stored onsite at any one time. 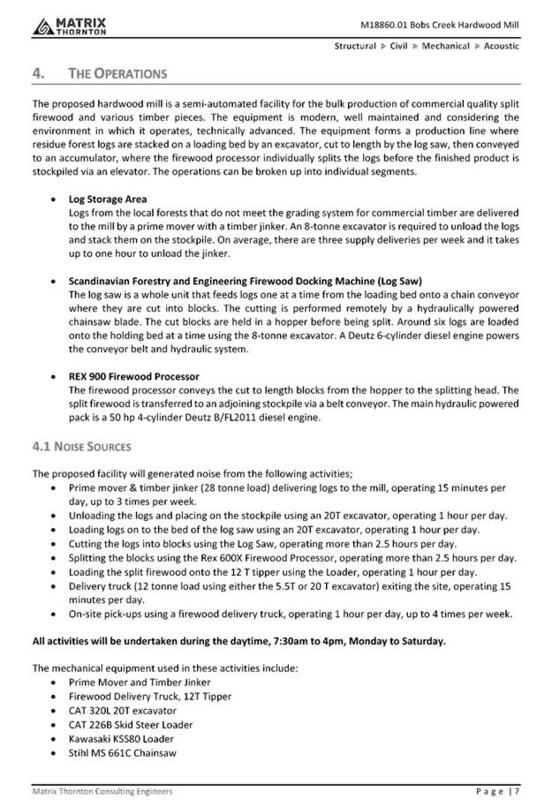 · Approximately two (2) to three (3) truckloads (28 tonnes per load) of timber will be delivered per week during the aforementioned hours of operation. 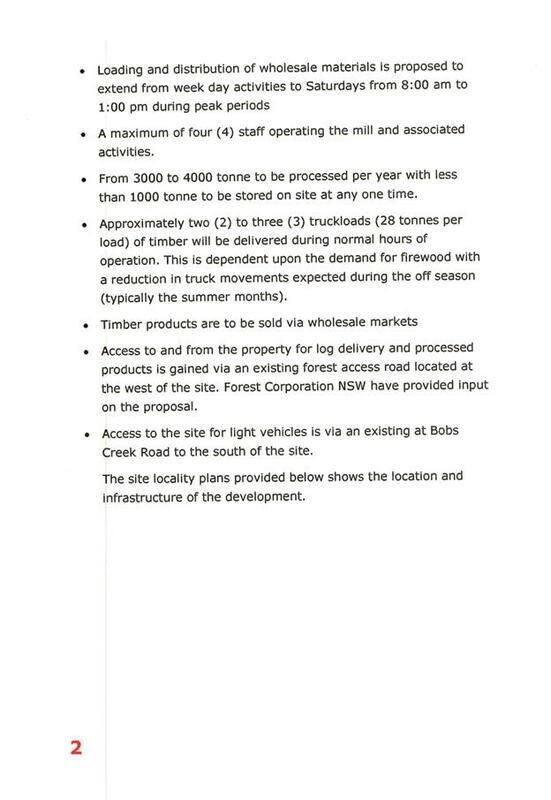 · Timber to be sold via wholesale market with no retails sales direct to the public occurring onsite. · A noise impact assessment has been undertaken. 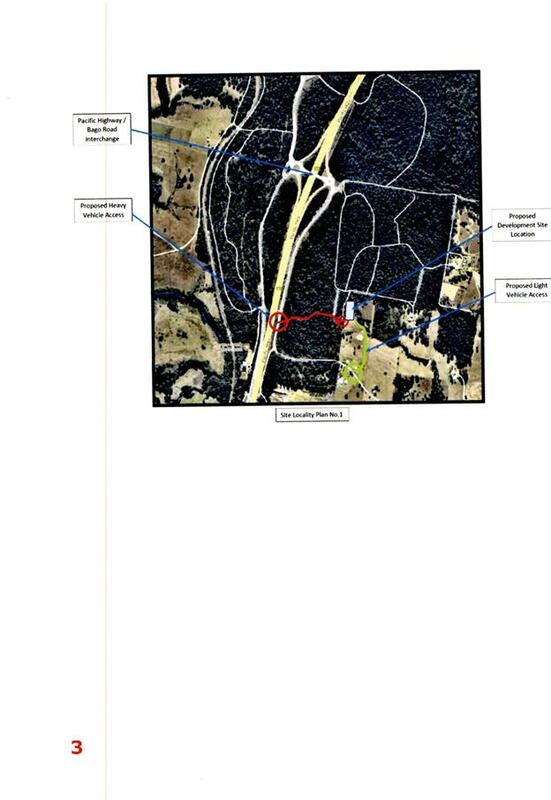 · Access for staff, people doing repairs and friends (light vehicles) will predominately be obtained via the existing southern private access/driveway off Bobs Creek Road. 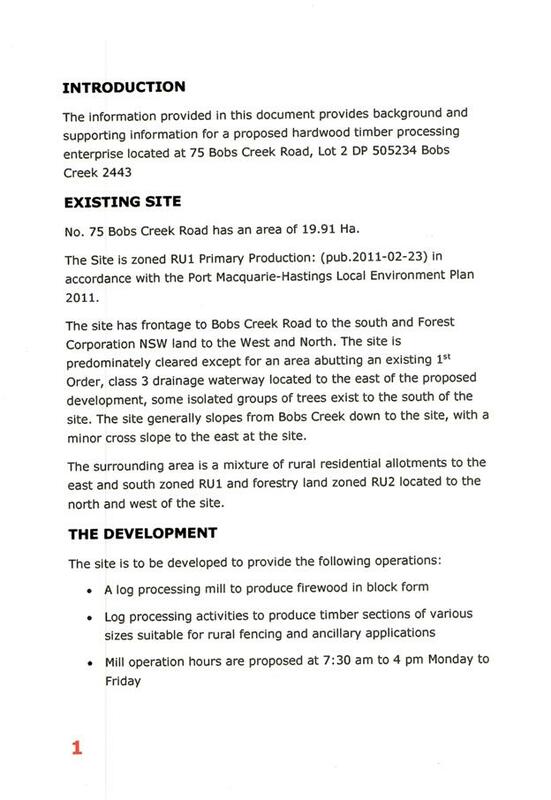 Access for trucks delivering and picking up timber will be via the existing western Forestry Road off Bobs Creek Road. 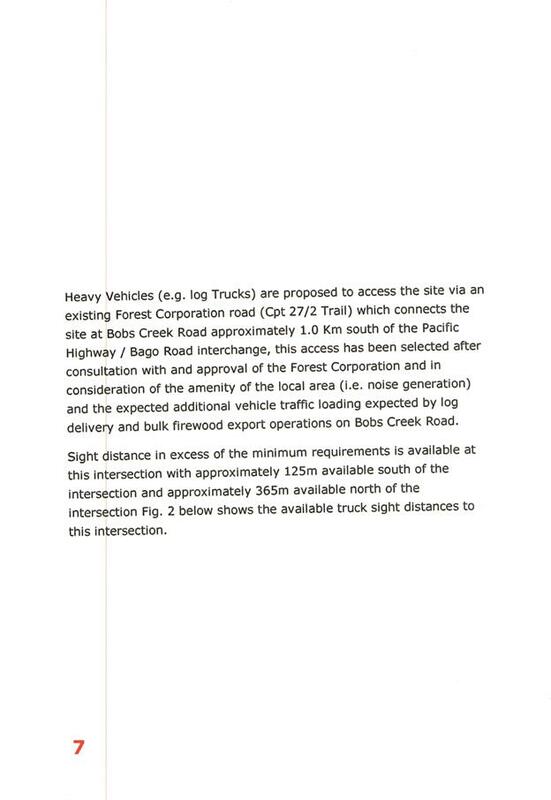 The Forestry access will ensure the larger timber trucks do not have to pass the neighbouring dwellings in Bobs Creek Road. · No burning of timber will occur onsite with waste timber to be recycled or sent to a waste management facility. 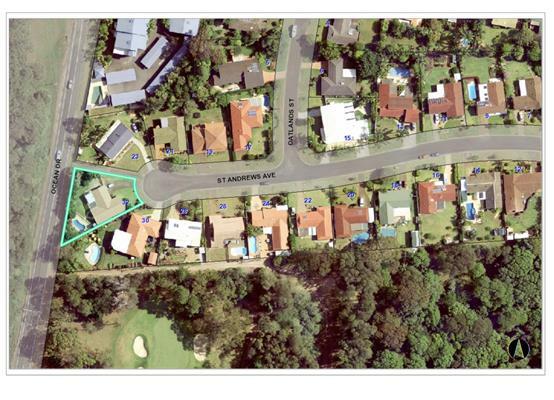 · No works are proposed within 40m of the eastern drainage line onsite. 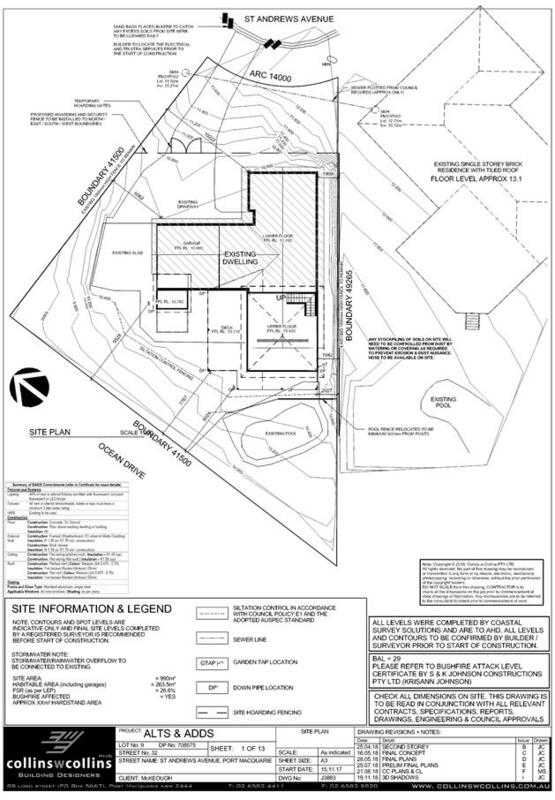 · No clearing is proposed onsite as part of this application. · Amenities facilities are available within the existing dwelling and shed onsite. · A twelve (12) month trial period is proposed to be condition to allow the applicant the opportunity to show compliance with conditions and to align with the Forest Corporation twelve (12) month access approval. Towards the end of the twelve (12) month trial, the applicant can modify the consent to extend the consent. · 18/7/2018 – Development Application lodged with Council. 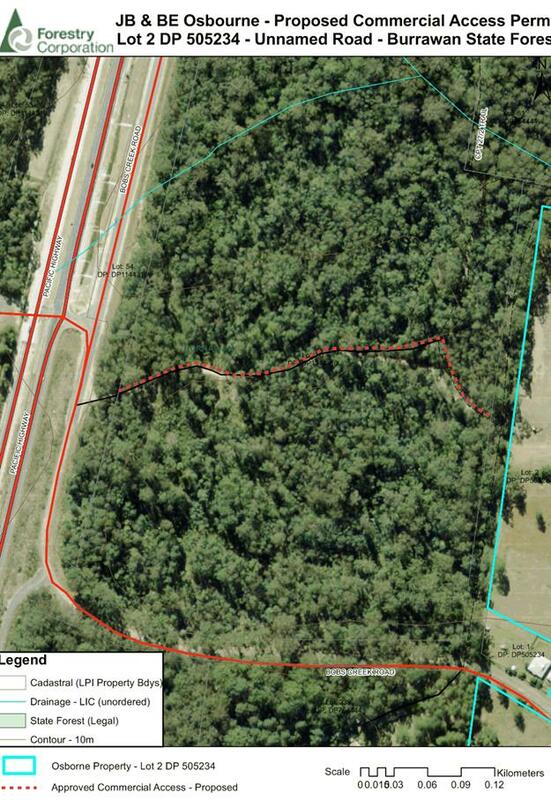 · 20/7/2018 – Council staff sought clarification from the applicant on noise impacts, works within 40m of drainage line, truck movements, amount of material to be processed, waste disposal, location of amenities, owners consent from Forestry Corporation to use forestry road for access to commercial operation, access and use of facility. Applicant acknowledged request. · 25/7/2018 to 7/8/2018 – Development Application notification period. · 31/7/2018 – Applicant provided update on additional information issues and that noise consultant would take approximately five (5) weeks to complete noise report (based on their workload). · 26/9/2018 – Update was provided to one of the objectors on the status of the application. The applicant also provided partial response to additional information issues. 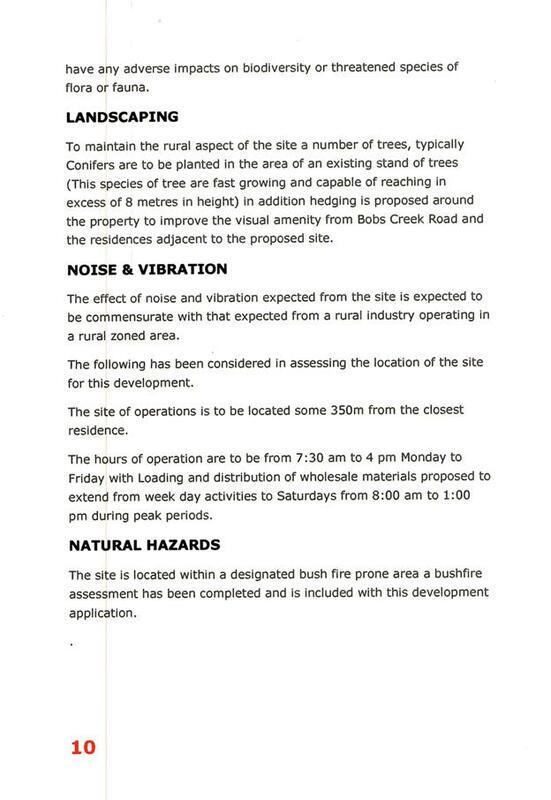 · 27/9/2018 – Applicant confirmed location of sawdust stockpile onsite. 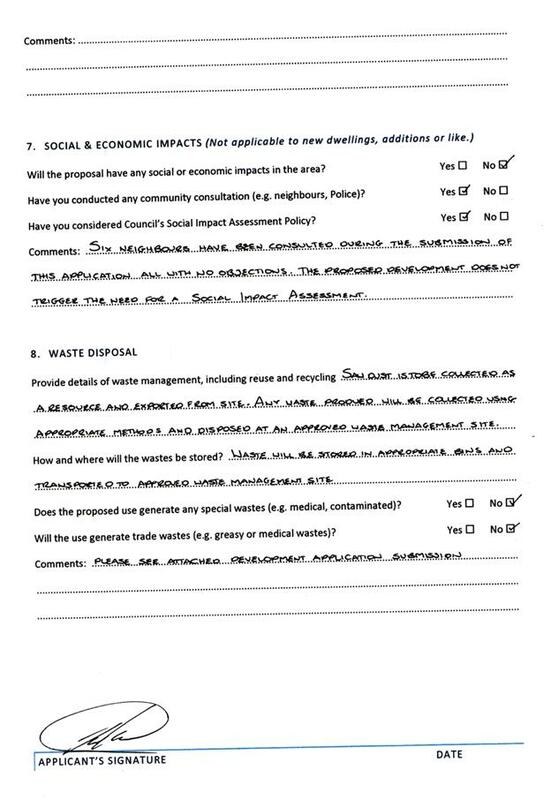 Update provided to one of the objectors who had requested status of the application. 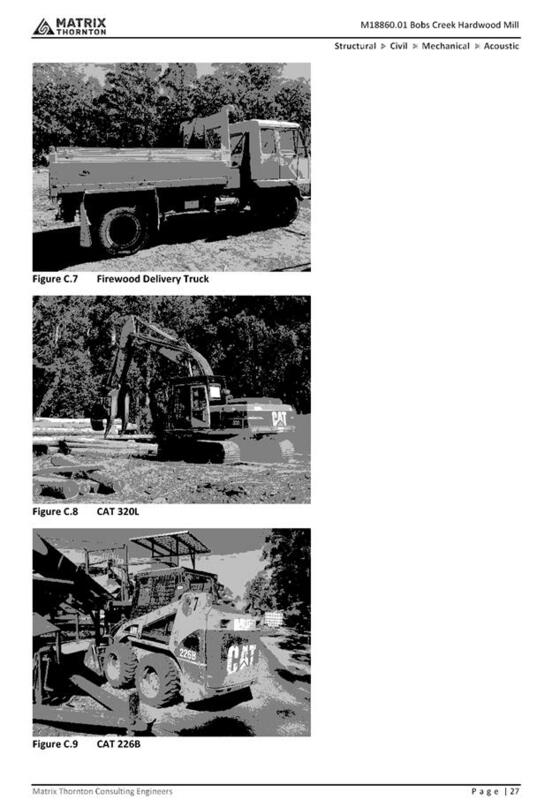 · 17/10/2018 – Council staff requested update on owners consent from Forestry Corporation. Applicant provided response. · 19/10/2018 – Update was provided to one of the objectors on status of the application. · 24/10/2018 – Applicant provide update on owners consent from Forestry Corporation. · 26/10/2018 – Forestry Corporation consent provided for 12 months. Council staff checked with applicant that they were aware consent was for only 12 months. 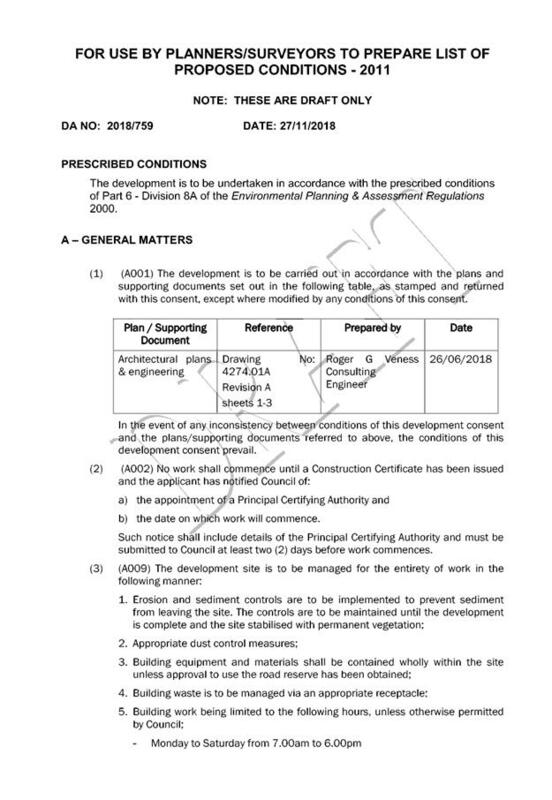 · 30/10/2018 – One of the objectors raised concerns with ongoing operations without consent. · 6&7/11/2018 – Update on status of the application provided to objector. Discussion with applicant on Forestry Corporation consent and Development Assessment Panel (DAP) process. Applicant requested copies of submissions. Council staff provided redacted copies of submissions to applicant. Applicant also discussed with Council staff that they would be obtaining letters of support. · 8&20/11/2018 – Discussion with applicant about obtaining pre-development application information. · 12&20/11/2018 – Discussion with one of the objectors and the applicant regarding a truck arriving before 7:30am. · 13&20/11/2018 – Applicant provided response to submission issues, which was acknowledged by Council staff. The subject SEPP was introduced to clarify the definitions for hazardous and offensive industries and to apply guidelines for the assessment of industries that have the potential to create hazards or an offence. In this case, the development has the potential to be an offensive industry by virtue of the noise component. Having considered the SEPP along with the associated application and imposition of conditions; the proposed development is not considered to be an offensive industry and will create no adverse impact. Proposal can be considered a rural industry. With reference to clauses 6 and 7, the subject land is greater than one (1) hectare and therefore the provisions of SEPP must be considered. In this case, the application has demonstrated that no habitat will be removed or modified (ie the development will occur within existing cleared areas). Therefore, no further investigations are required. Given the nature of the proposed development and proposed stormwater/erosion control that will be in place; the proposal will be unlikely to have any adverse impact on existing aquaculture industries. While the lower part of the property (south of Bobs Creek Road) contains land affected by the SEPP; no development is proposed within such an area. In particular, the proposed development is located over 300m from land affected by the SEPP. The development does not trigger any of the clauses or thresholds in the SEPP. Log processing is a permissible use in a rural zone. The use will not impact on the overall rural use of the site or surrounding areas. In addition, the portable nature of the business ensures no long term impact on the land. Refer to above comment. The rural planning principles are specifically addressed later in this assessment table. Conditions are to be imposed to manage conflicts arising from such issues as noise and visual impact of the development on adjoining properties. In particular, screening of the site, additional mufflers, enclosure around engines, restrictions on access/use etc will be utilised. The development will not affect the viability of any state significant agricultural land. As mentioned previously, the portable nature of the business ensures no long term impact on the land. 2(e) to amend provisions of other environmental planning instruments relating to concessional lots in rural subdivisions. 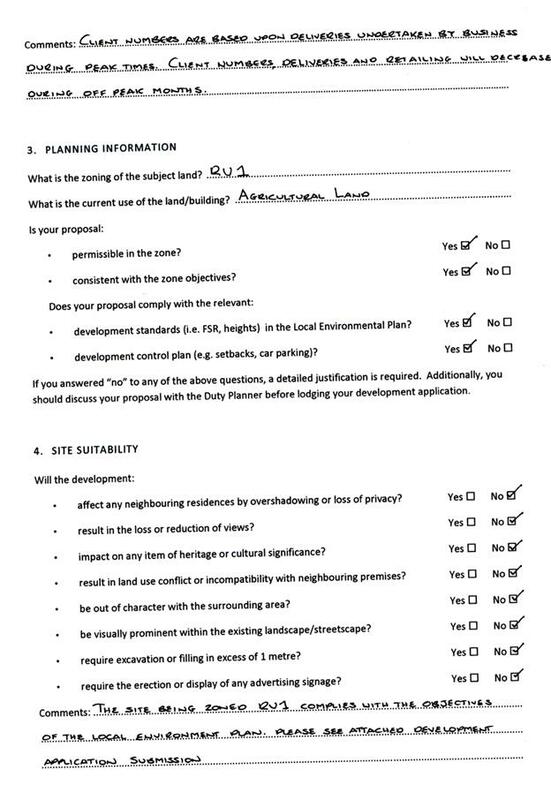 Local environmental planning provisions have removed concessional lots. The development will not affect the productivity and sustainability of surrounding rural areas. Most of the immediate properties comprise either forestry land or smaller rural farms/hobby farms or rural residential sized lots. Refer to above comment. In addition, the proposed use comprises rural based elements i.e. processing of a primary product (timber). The processing of a primary product for firewood purposes and typically rural fencing products plays a role in the local community through maintenance of jobs and expenditure, while also providing a product (firewood and fencing) to the area, state etc. 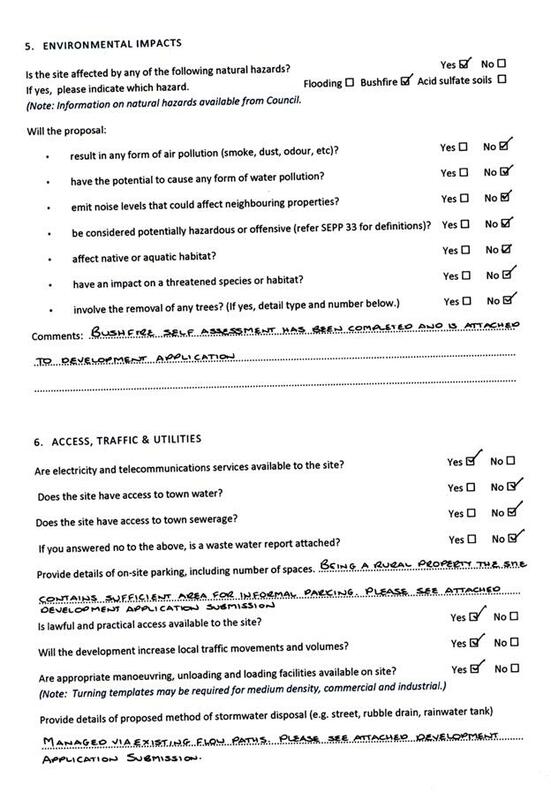 The zoning of the site allows for the use with other issues such as noise, access, servicing etc having been considered in this assessment report. Impacts are considered manageable through conditions. This application deals with the processing of a primary product. The product (trees) would have already been approved to be removed elsewhere in supplying this business (ie the trees are approved as a separate process to this application). In addition, the processing of timber onsite will occur within a cleared section of land, clear of any sensitive environment land. This will also ensure no further adverse impact on flora and fauna onsite. The development does not involve subdivision or impact on rural settlement opportunities. 7(h) ensuring consistency with any applicable regional strategy of the Department of Planning or any applicable local strategy endorsed by the Director-General. The development is not inconsistent with any strategy. 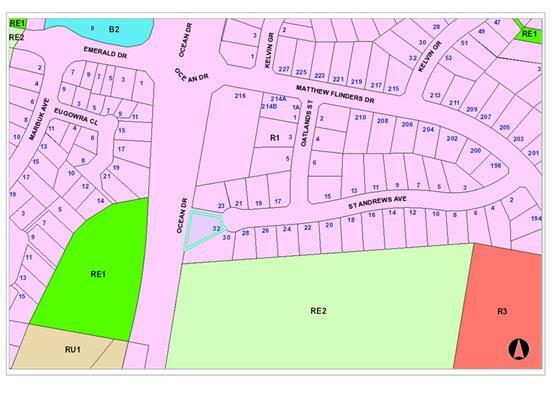 No subdivision or dwellings proposed. The requirements of this SEPP are therefore satisfied. · Clause 2.2, the subject site is zoned RU1 Primary Production. In accordance with clause 2.3(1) and the RU1 zone landuse table, the proposed development for a rural industry (log processing industry) is a permissible landuse with consent. o The proposal does not impact on the resource base. o The proposal encourages diversity by providing an alternate primary industry. o The proposal does not fragment land or alienate a resource base. · Clause 5.10, the site does not contain or adjoin any known heritage items or sites of significance. The area is also disturbed from past agriculture/grazing purposes. 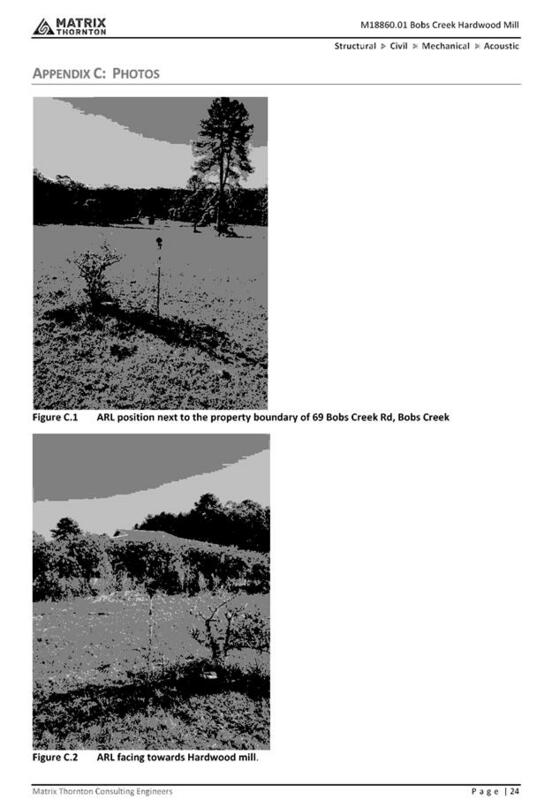 · Clause 7.3, the lower part of the site (south of Bobs Creek Road) contains land within a mapped “flood planning area”. However, this development is located on the northern side of Bobs Creek Road, well clear of the flood prone area. Flood free access is also retained. As a result of the above, no further consideration of flooding provisions required. · Clause 7.13, satisfactory arrangements are in place for provision of essential services including water supply, electricity supply, on-site sewage management, stormwater drainage and suitable road access to service the development. (b) that have an intended processing capacity of more than 50,000 cubic metres of timber per year. The proposed development is not designated as it does not have an annual processing capacity of 6000 cubic metres (approximately 4600 cubic metres proposed per annum), will be located 40m from a natural waterbody and will not burn any waste. Conditions will also be imposed to reinforce compliance. There are no relevant draft instruments that are applicable to this site or development. · 3m from any secondary road frontage. 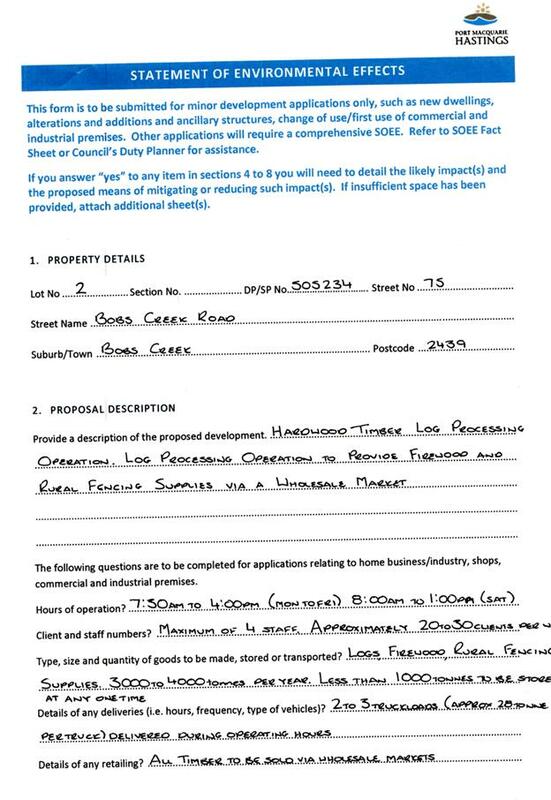 Development is setback approximately 200m from Bobs Creek Road. · a combination of a number of these materials. No buildings proposed. Milling structures are more portable/machinery type structures. Nonetheless, the structures are approximately 200m from Bobs Creek Road and screened via logs and vegetation. Large unrelieved expanses of wall or building mass are not favoured, and as such should be broken up by the use of suitable building articulation, fenestration or alternative architectural enhancements. Material storage/work areas and volumes to be provided with application. Storage and work areas shown on plans. Open work and storage areas to be located at rear of premises and screen from view by landscaping and/or fencing minimum 2m high. Work areas and storage are located approximately 200m from Bobs Creek Road and suitably screened via logs and vegetation. Considered not applicable to this application given the separation to roads/adjoining dwellings and existing vegetation. Screening will also be covered by conditions of consent. Landscaped strip 3m wide for 2/3 of each road frontage. No fencing in front setback unless for display items. High quality fencing and landscaping. · Includes seating, tables and rubbish bin. · Is safely accessible to all staff. · Is separate private from public areas. · Is located away from noisy or odorous activities. Area exists onsite for casual amenities/recreation by staff. Provide onsite facilities for changing, showering and secure bike storage. Facilities available at the shed/dwelling onsite. 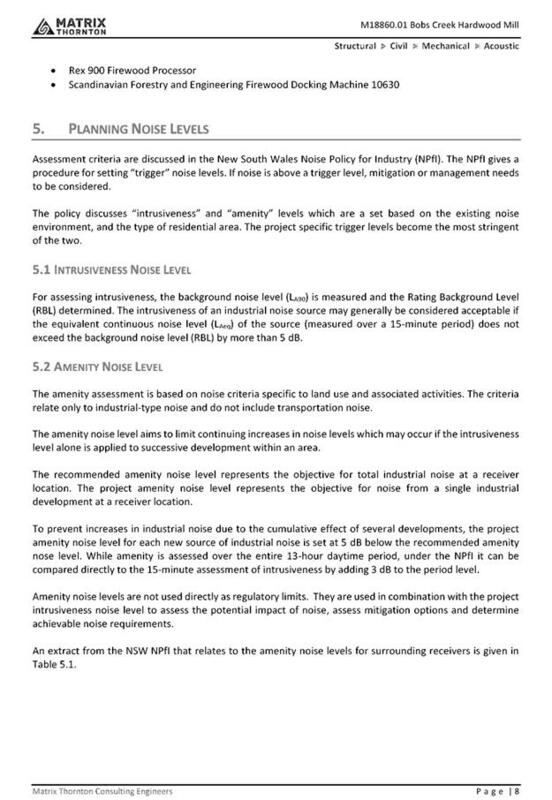 Development complies with NSW Industrial Noise Policy. 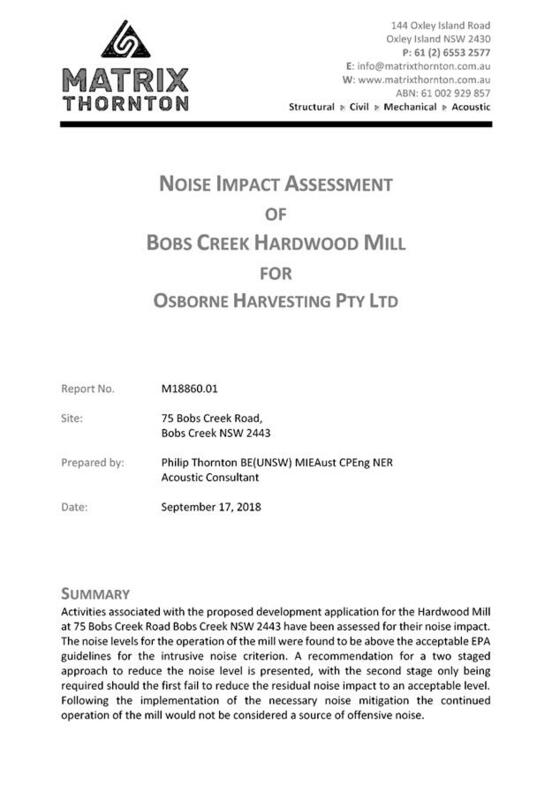 A noise impact assessment was submitted with the application. The assessment was reviewed by Council’s Environmental Health Officer and deemed capable of complying, subject to conditions. 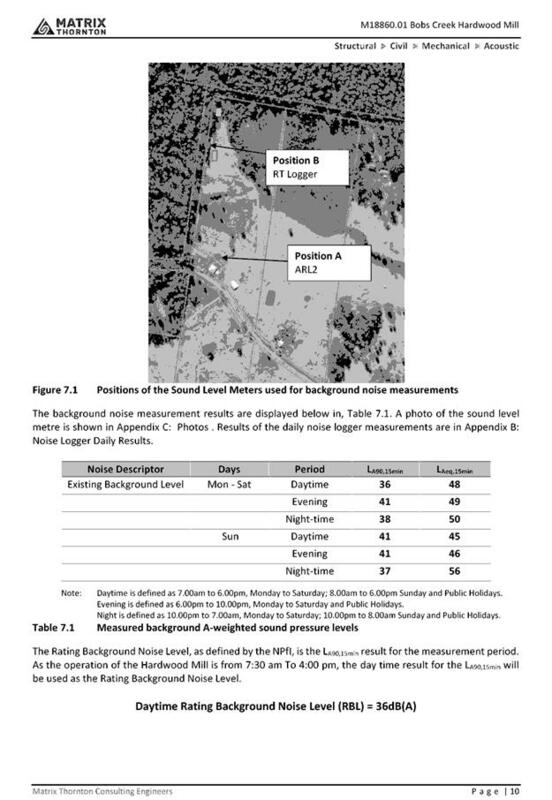 It should be noted that noise impacts and associated comments are addressed in more detail later in this report. Building openings located to minimise noise impacts if within 400m of residential zone. No buildings proposed. Conditions will be imposed to manage noise. External plant such as generators, air conditioning plant and the like, should be enclosed to minimise noise nuisance and located away from residences. Conditions are proposed to enclose plant. External and security lighting should be directed and shielded to avoid light spillage to adjoining residential areas. No lighting proposed. Development will not operate outside of daylight hours. Driveways should be arranged or screened to avoid headlight glare on residential windows. No new driveways proposed. In addition, the development will only operate during daylight hours, which will negate the use and impact of headlight glare. · That the office component of a proposed development is ancillary to the functions carried out in the factory, warehouse or other industrial use. · That the office area is not leased to a separate company or entity. · That parking facilities are adequate to cater for the size of the office development. Garbage storage areas are not visible from a public place. The subject site has an existing dwelling that can provide surveillance of the site. CCTV can also be installed to provide further security when the site is not in use. No other adverse concealment, entrapment or crime issues foreseen. 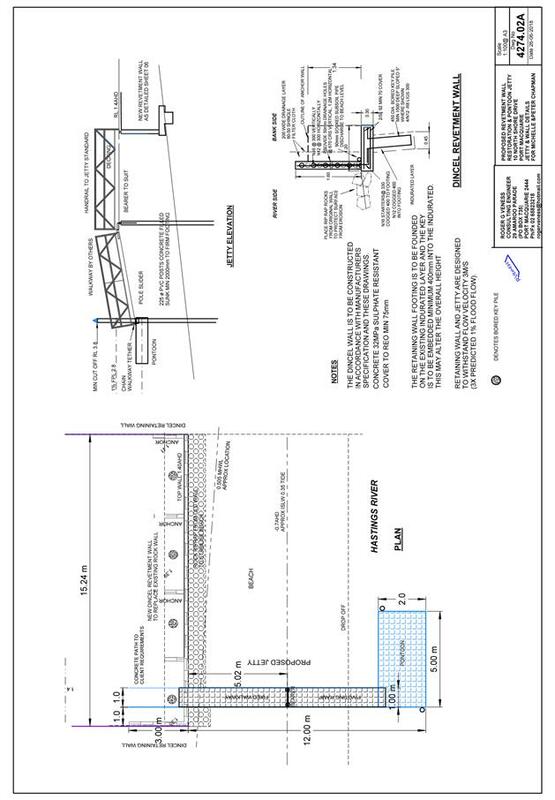 Loading ramp exceeds 1m in height and will be conditioned to require certification from a structural engineer. No tree removal proposed or required. No new access proposed, including to an arterial or distributor road. Driveway crossing/s minimal in number and width including maximising street parking. No new access or driveway proposed. Off-street parking in accordance with Table 2.5.1. Reduction possible if supported by parking demand study. Being a rural property, the site contains sufficient area for informal parking associated with the development. There is an existing strip of vegetation south of the operations area, which suitably screens the development and parking from surrounding areas. Being a rural property, the gravelled driveway is acceptable. In particular, gravel driveways and roads are common in rural zoned areas. Conditions will be imposed to manage dust. Driveway grades are acceptable and easily traversed by two wheel drive vehicles. Where visible from the public domain, loading bays are located behind the building. The loading areas are partially screened by existing vegetation onsite. Conditions will also be imposed to create stockpile screens. Where loading bays are located close to a sensitive land use, adequate visual and acoustic screening is provided. Plans to confirm vehicular access, circulation and manoeuvring in accordance with AUSTROADS and AS 2890. Being a large rural property, adequate area exists onsite to allow manoeuvring of the vehicles that will use the facility. Vehicles will also be able to enter and exit the site in a forward direction with suitable site distances. 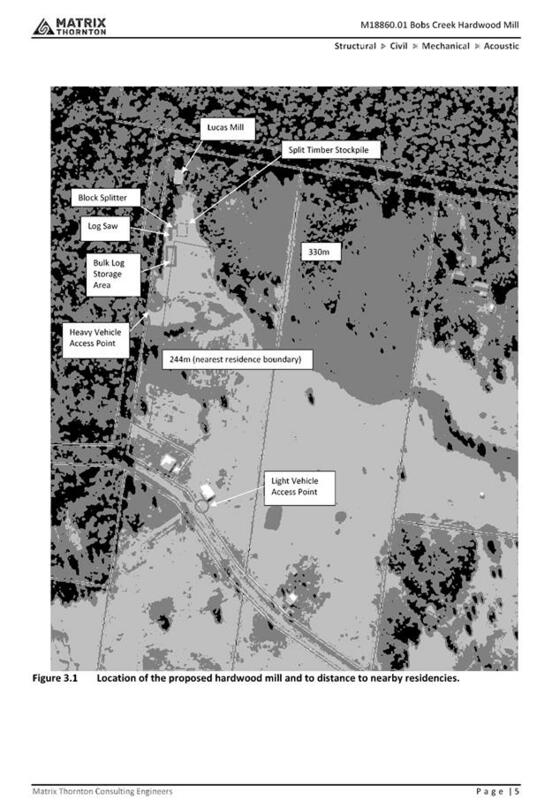 The site has frontage to Bobs Creek Road to the south and also west (via a Forest Corporation road connection). The property is predominately cleared except for some timbered areas in the north east corner surrounding the proposed log processing site and also a small section along Bobs Creek on the southern portion of the overall lot. The property contains an existing dwelling on the southern portion of the property (ie south of Bobs Creek Road) and a shed on the northern portion. Surrounding the development is a mixture of rural residential sized lots, smaller hobby farm sized lots and some larger rural properties. There is also Forest Corporation land to the north and within the overall locality. Subject to the imposition of noise control measures, screening and a twelve (12) month trial; the proposal will be unlikely to have any significant impact on adjoining properties. The site is considered to be compatible with the area and adequately addresses planning controls. The proposal will be unlikely to have any adverse impacts in terms access, transport and traffic. The volume of vehicles proposed is not excessive with trucks to be re-directed away from adjoining dwellings via the use of the forestry road. The existing road network will satisfactorily cater for the small increase in traffic generation as a result of the development. Utilities are not specifically required for the development but can be made available at the applicant’s expense. Onsite water storage will be utilised. Cleaning and toilet facilities are available within the existing shed and dwelling onsite. Capable of being managed onsite via conditions of consent. There is also substantial grassed areas between the site and nearby watercourses to act as a natural filter. The proposed development will be unlikely to have any adverse impacts on soils in terms of quality, erosion, stability and/or productivity subject to a standard condition requiring erosion and sediment controls to be in place during operation. Potential exists for sawdust to be generated onsite however given the separation distance to the neighbouring properties, it is unlikely that there will be any impact on adjoining residents. Potential exists for wood smoke to adversely impact on adjoining residents and local air quality if wastes are burnt on the premises. It is recommended that the consent prohibit the burning of any waste products and/or off cuts etc. The proposed development will not require any removal/clearing of any significant vegetation onsite and therefore will be unlikely to have any significant adverse impacts on biodiversity or threatened species of flora and fauna. · 60LAeq (including 5dB(A) tonal penalty (52LA90; and 57L10)). 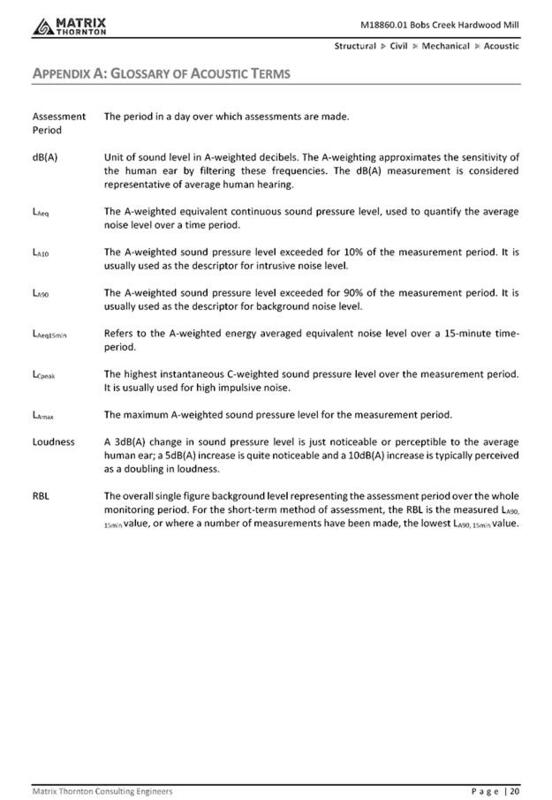 The measured operational level of 60dB(A) is in excess of the 41dB(A) Project noise trigger level by 19dB(A). 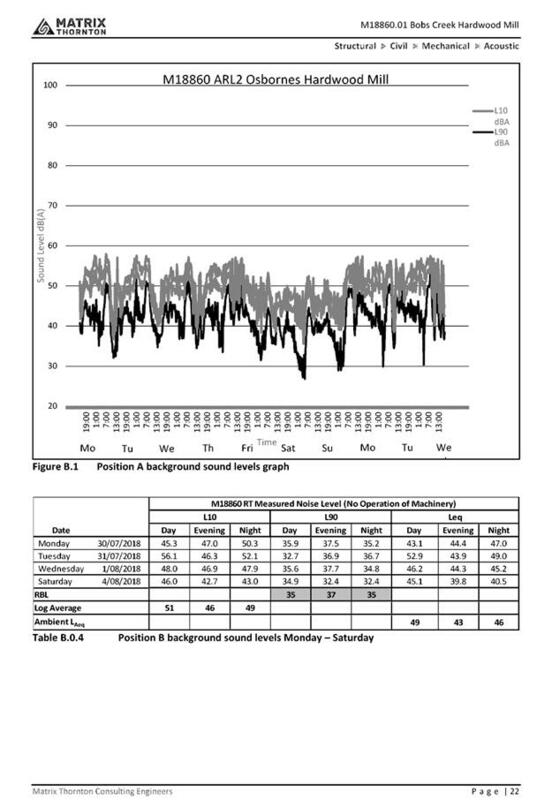 The intrusiveness of an industrial noise source may generally be considered acceptable if the equivalent continuous noise level (Laeq) of the source (measured over a 15 minute period) does not exceed the background noise level by more than 5dB. Matrix Thornton suggested a two (2) stage mitigation strategy to reduce noise impacts to the nearest residential receiver. ‘Stage 1’ of the mitigation strategy would require the installation of a secondary exhaust silencer or muffler on the diesel engines involved in the proposed development. ‘Stage 1’ of the mitigation strategy would also involve the installation of an acoustic barrier surrounding operational machinery. 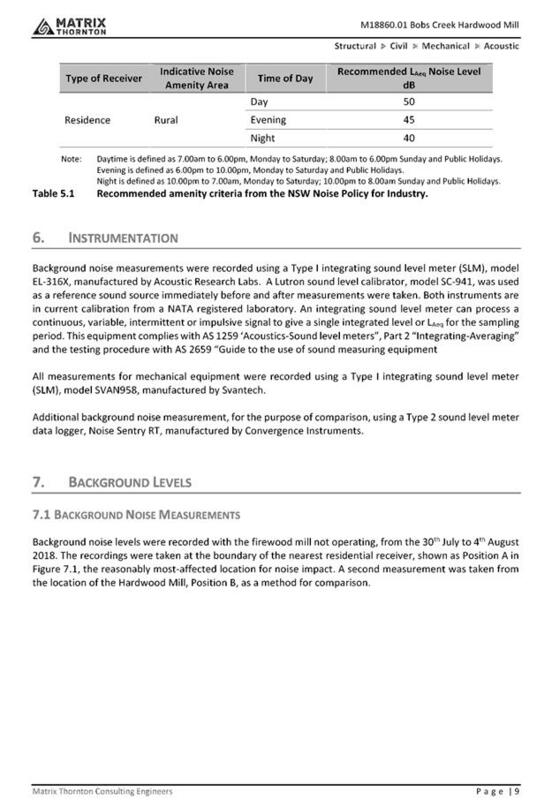 Matrix Thornton predicts that such measures will reduce noise impacts by approximately 10 dB(a), including reduced tonality of the noise, which will remove the 5dB(A) tonal penalty. 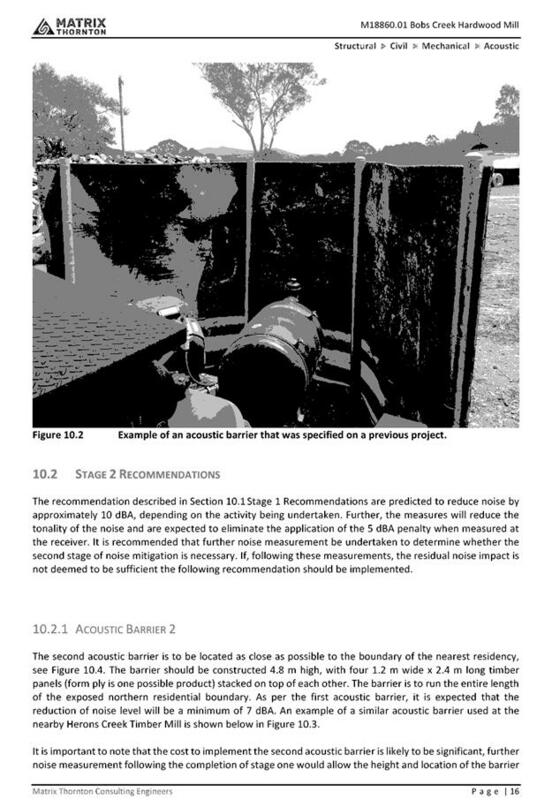 ‘Stage 2’ of the mitigation strategy involves the installation of a second acoustic barrier between the first acoustic barrier and the property boundary. The second barrier is noted as being required to be located as close as possible to the boundary of the nearest residency. The barrier should also be constructed 4.8 m high, with four 1.2 m wide x 2.4 m long timber panels (form ply is one possible product) stacked on top of each other. The barrier is to run the entire length of the exposed northern residential boundary. 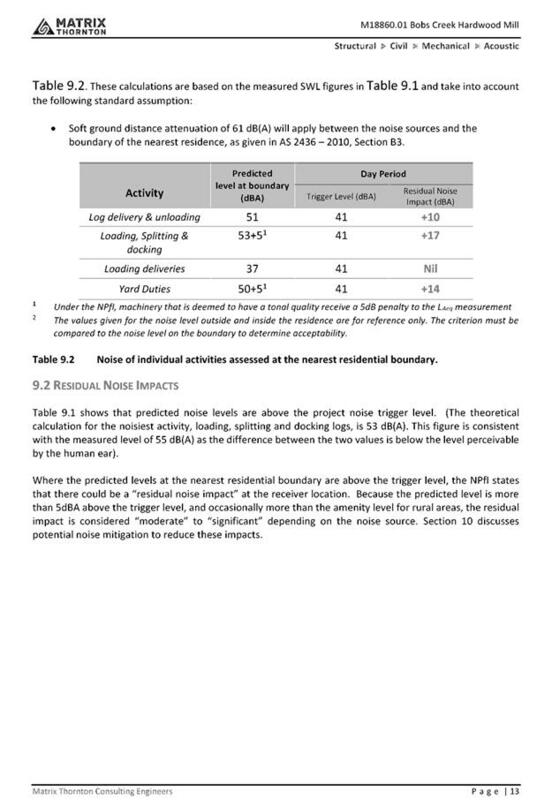 Matrix Thornton indicated that the secondary barrier could further reduce the noise impacts from the proposed development by at least 7 dB(A). In terms of the two (2) stages, Matrix Thornton also suggested that Stage 1 could be implemented first and then further testing done to see whether Stage 2 was required. However, the applicant has indicated that they are prepared to implement both Stage 1 and 2 upfront. 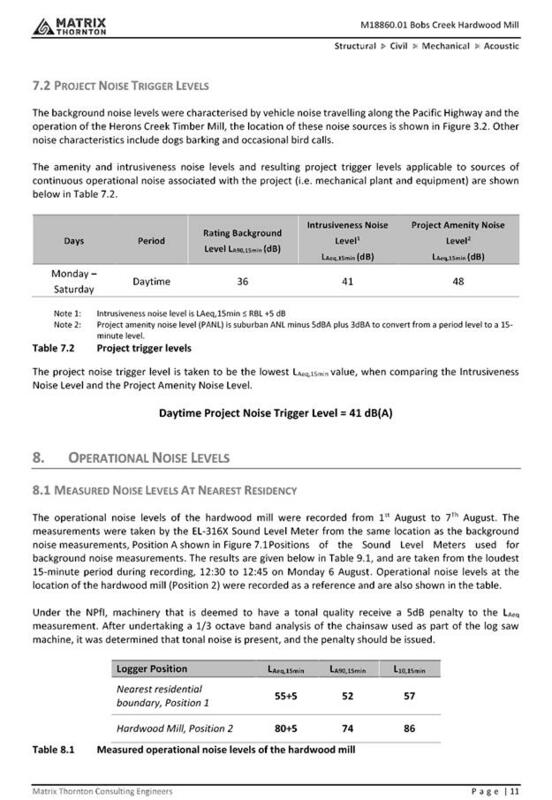 Overall, Matrix Thornton concluded that the combination of the ‘Stage 1’ and ‘Stage 2’ mitigation measures would reduce the operational noise level to below the 41dB(A) project noise trigger and that ‘the continued operation of the mill following the required implementation of noise mitigation would not be considered a source of offensive noise’. Having considered the noise report, a concern with the recommendations is the visual impact of the second barrier next to the neighbouring dwelling. As a result, an alternate barrier is proposed to be located closer to the mill. In particular, it is suggested that a wood stack comprising either log storage, offcut storage, waste timber storage etc be located south of the mill to form a visual and acoustic barrier. The stack would need to be maintained at all times and be a minimum of 3m in height. 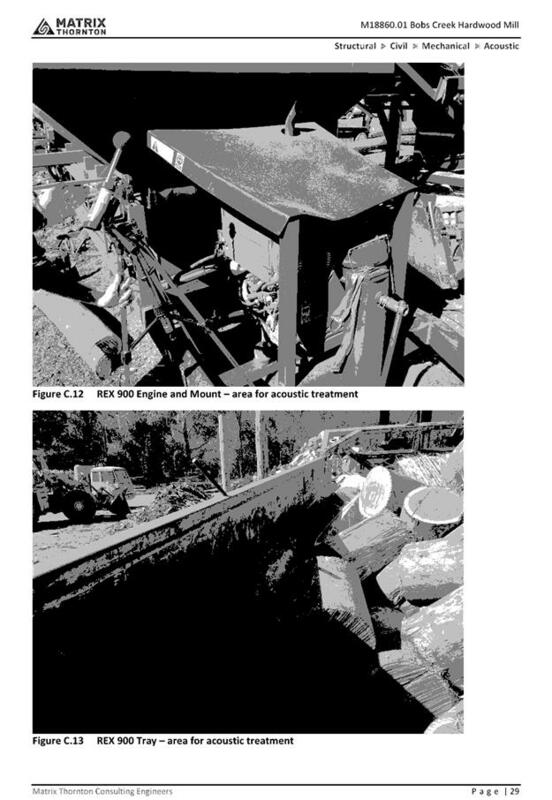 A similar measure was applied by Council to another log processing facility and proved to be effective in reducing visual and noise impacts. Furthermore, as an occupation certificate is not required for the use and the business has been operating already; a suitable approach would be to condition the implementation of Stage 1 and 2 within six (6) weeks of the date of determination. This should allow suitable time for the measures to be put in place. In addition to the above, Council will condition the consent be limited to twelve (12) months to act as a trial for the consent. This will allow noise impacts to be further monitored. 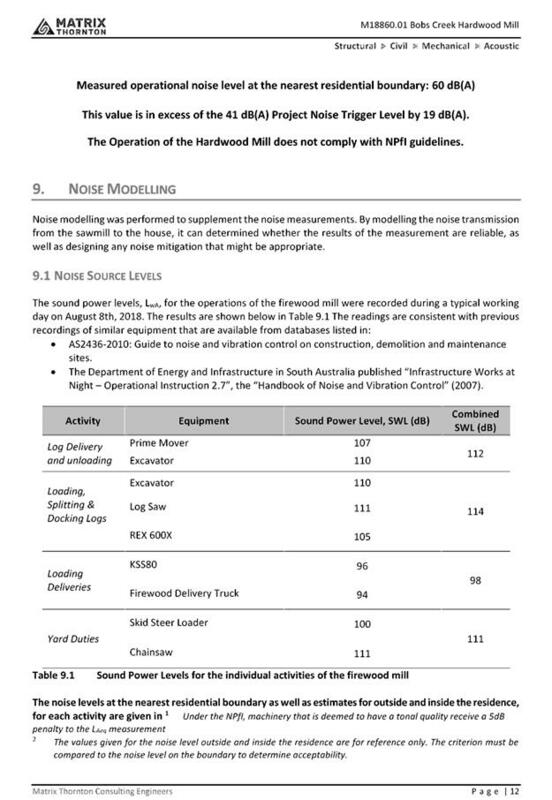 The above noise report and proposed measures (including alternate wood stack barrier) were considered by Council’s Environmental Health Officer and considered an acceptable approach in managing noise impacts to a compliant level. 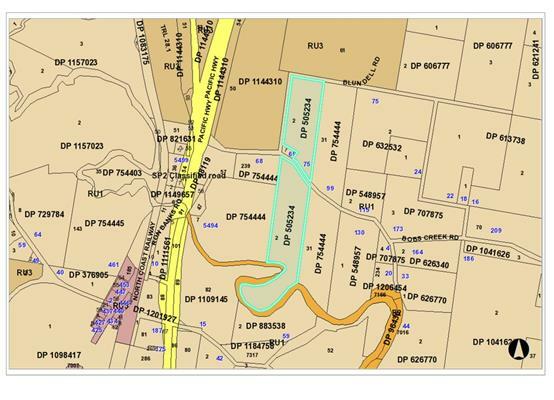 The site is mapped as bushfire prone land. No buildings are proposed and it is considered that the bushfire legislation does not apply to the use. 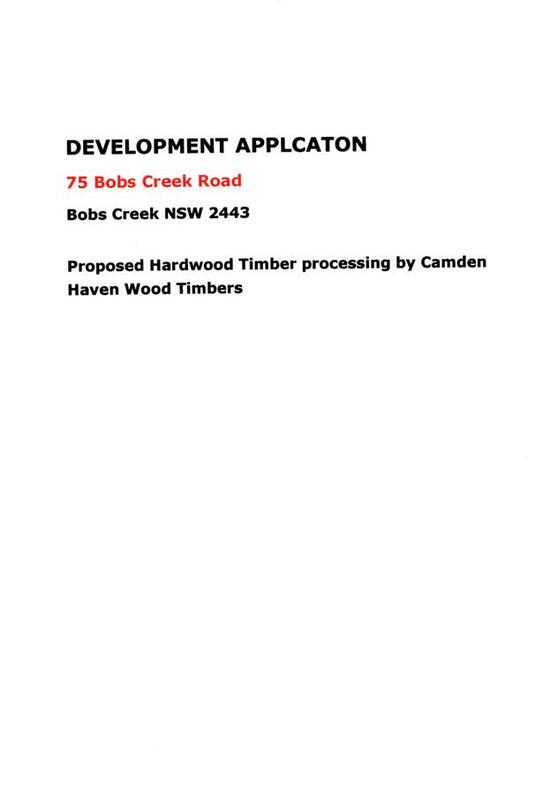 Similar sawmill type developments have been referred to the local NSW Rural Fire Service for comment in the past. However, based on the nature of the operation and lack of residential structures, the NSW Rural Fire Service provided a response raising no concerns or issues in relation to bushfire. In terms of the wood piles creating a hazard, the site contains a dam that can be used as a water source to help put out any fires that may occur. Adjoining dwellings are also well separated from the woodpile by over 100m. This would also allow further protection/buffering in the event of a fire. Based on the above, bushfire or adverse fire hazards are unlikely to occur as a result of the development. No adverse impacts. 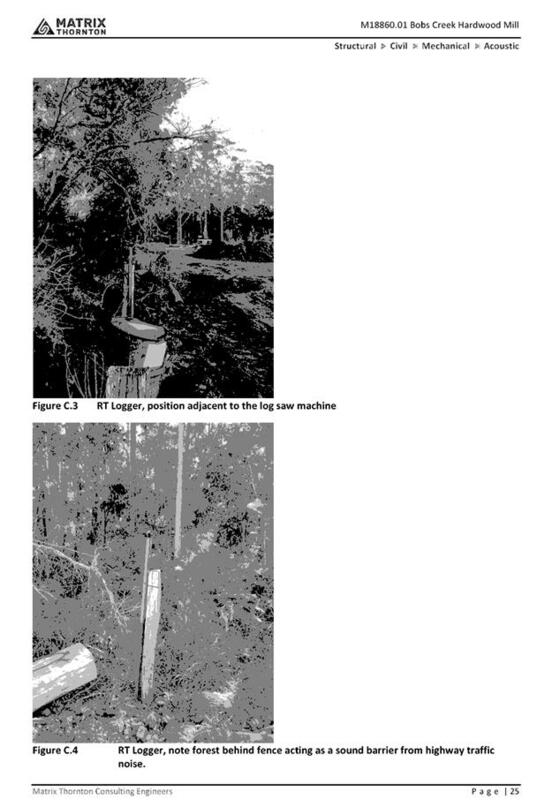 Likely positive impacts can be attributed to the operation of the development through the maintenance of employment in the timber/logging industry and associated flow on effects such as expenditure in the area. The proposed development design satisfactorily responds to the site attributes and the imposition of various conditions will ensure the development fits into the locality. The proposal will fit into the locality and site attributes are conducive to the proposed development. The site is located within a semi-rural setting, is zoned for primary production activities and it can be reasonably expected that primary production activities will be conducted in the area. The proposal operates 24/7. Staff arrive from 6:30am, heavy machines 7:00am, trucks all day and night. The proposal operates in summer out of firewood season. Conditions will be imposed to control hours of operation (including vehicles picking up and dropping off product) to 7:30am to 4:00pm Monday to Friday and 8:00am to 1:00pm Saturday. Area not used for agriculture but more rural residential. Not an industrial area. Recent approval for dwelling was on the basis that the area is not used for agriculture. While there are lots in the area more conducive to rural residential, there are still hobby farms and rural activities occurring in the area. Furthermore, the rural zone allows rural industries, the site is considered acceptable for the use and conditions of consent will mitigate impacts. Proposal does not comply with RU1 zone objectives in minimising conflict. The aspects of the site and proposed conditions of consent are considered to result in the proposal not creating any adverse conflict. The shed onsite is being used as a dwelling. The use of the shed is not the subject of this application. Council’s Compliance Team has and will continue to monitor this as a separate issue. Forest access not suitable for large vehicles. The forest access is considered of suitable construction and capable of allowing a range of vehicle types. 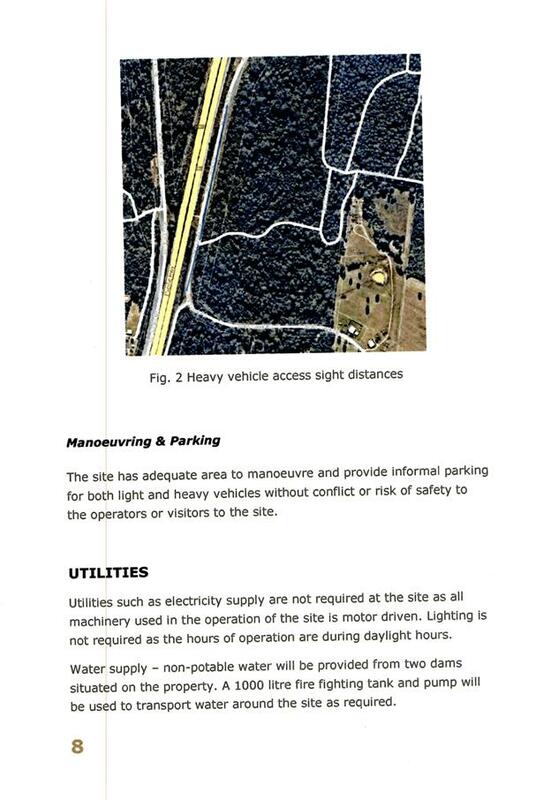 The applicant will need to continue to monitor this with the Forest Corporation, especially given no heavy vehicle access will be allowed from the existing southern light vehicle access. 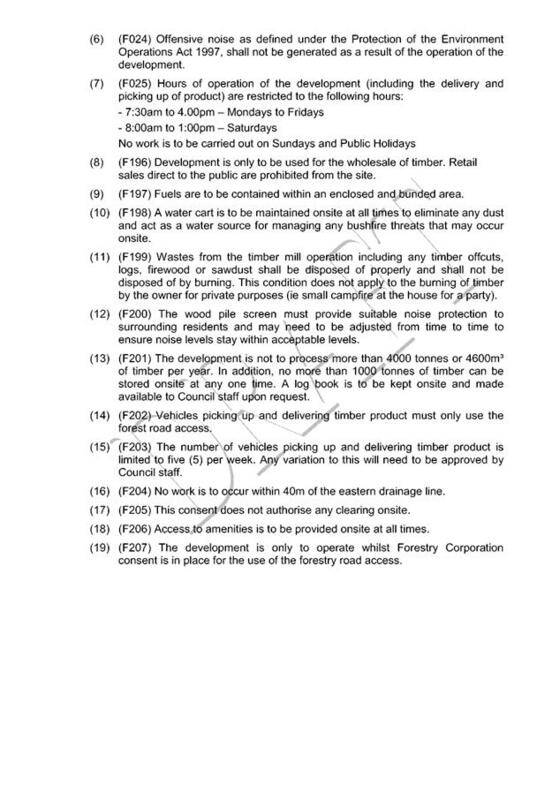 Being a forestry road, it would need to cater for Forestry Corporation logging trucks regardless of this application. Applicant has failed to comply with the agreed practices. The imposition of a consent and associated conditions will allow a more certain point of monitoring and compliance. A twelve (12) month trial is also proposed. Bobs Creek Road pavement is failing and not suitable. Mud and dust problems. 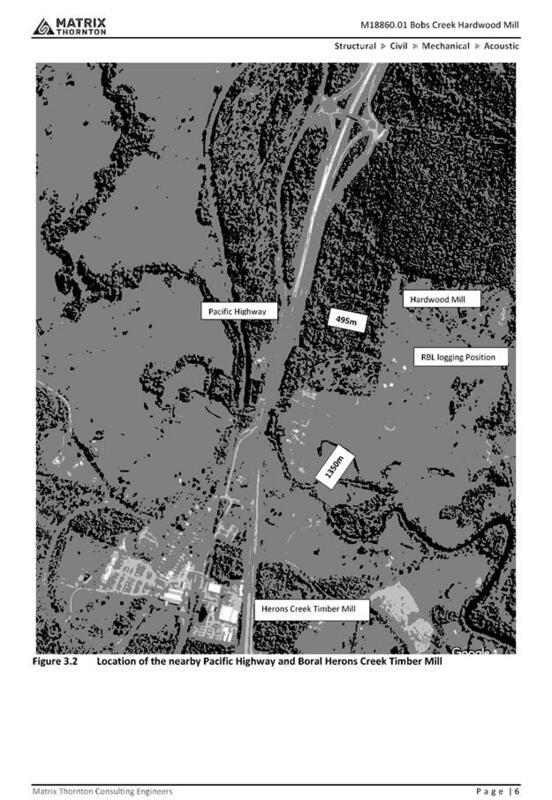 Bobs Creek Road and the associated pavement is suitable for the scale of development. In addition, the heavy vehicles will be required to use the forestry road, which will further minimise impacts on Bobs Creek Road. 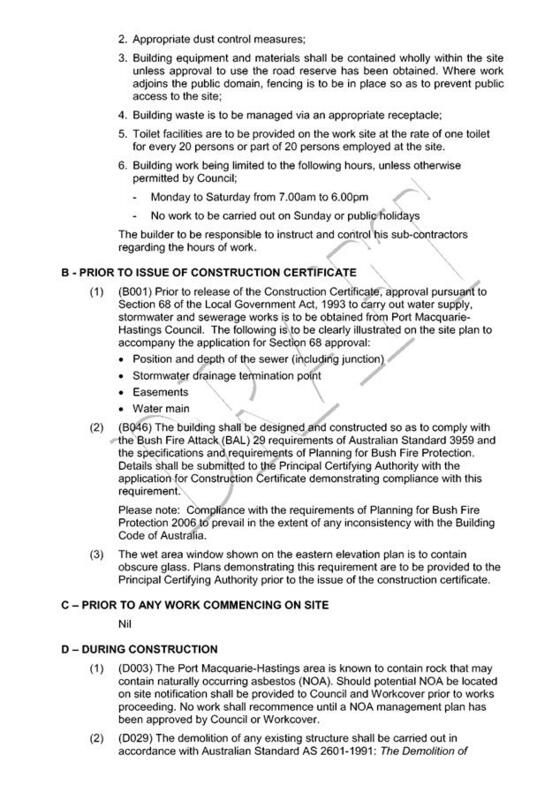 Standard site management conditions will be imposed to control dust etc. Loss of property values is not a matter of consideration under Section 4.15. Previous logging applications have not proceeded. 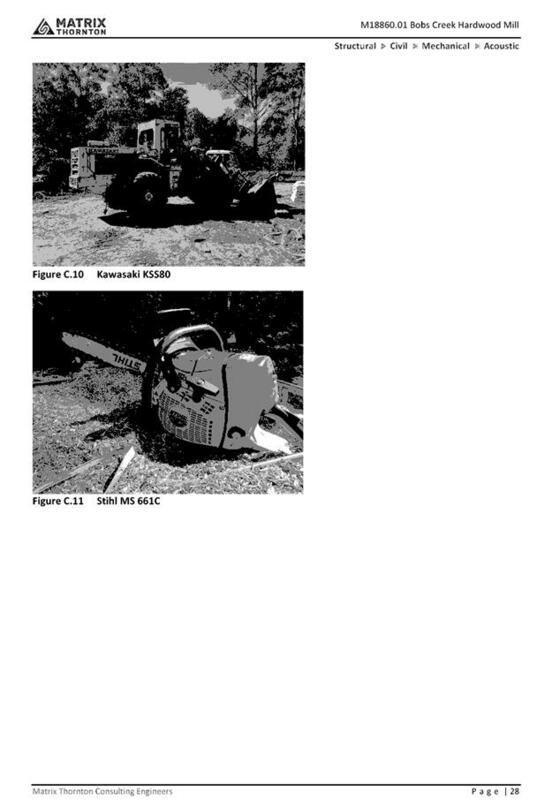 Forestry roads are designed and expected to cater for logging trucks - the proposal does not change this. Furthermore, the forest road will not allow high speeds, which will provide suitable warning to users. The statement of environment effects contains incorrect information. Noted. Matters in the statement of environmental effects have been clarified and conditions of consent imposed to provide further certainty on the use. Utes and cars with trailers use the site for private sales. Moving forward, no private sales will be allowed from the site and conditions of consent will reflect this. 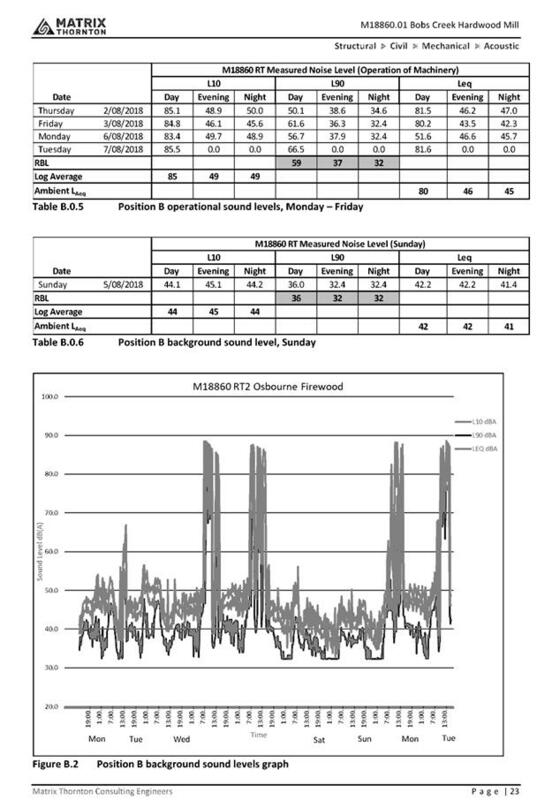 Air pollution/smoke and noise/vibration impacts. Fumes from the mill are consistent with other farming equipment that can occur on a rural property. There is also approximately 200m separation to the nearest dwelling, which will further dissipate any fumes. No burning of timber will be conditioned – removes smoke impact. 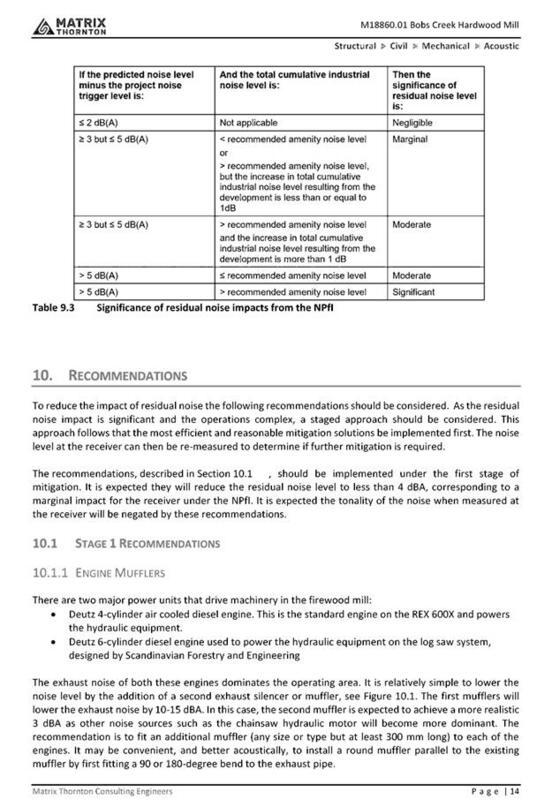 Noise impacts are addressed under the Noise and Vibration heading within this report. There is no requirement for an applicant to consult with neighbours, prior to lodging a development application. 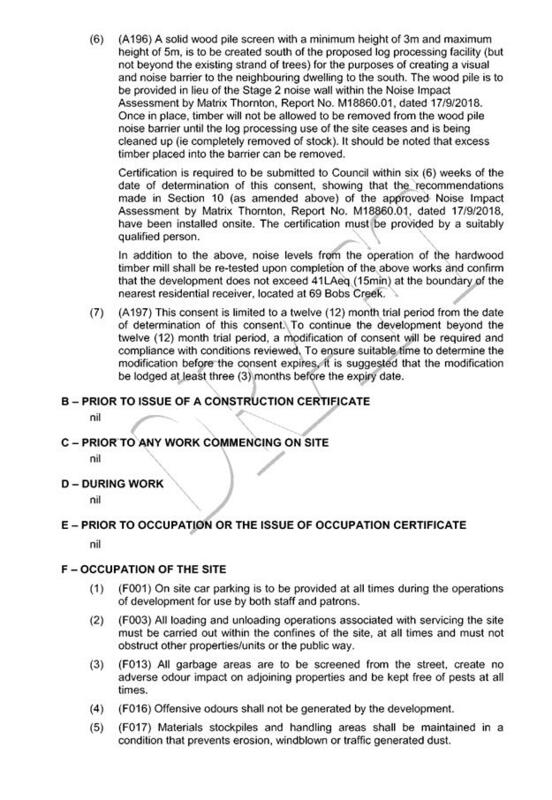 Council carried out standard notification as part of the development application process. The tonnage doesn’t stack up with vehicle numbers. This has been clarified and conditions imposed to control numbers. The dam does not form part of this application. Nonetheless, a preliminary look indicates that it is capable of complying with exempt dam provisions. Heavy vehicles use the light vehicle access. Noted. Moving forward, conditions of consent will be imposed to stop this practice. Machinery compliant with industry standards. This is a matter for the applicant to ensure from an OHS perspective, RMS road safety perspective etc. 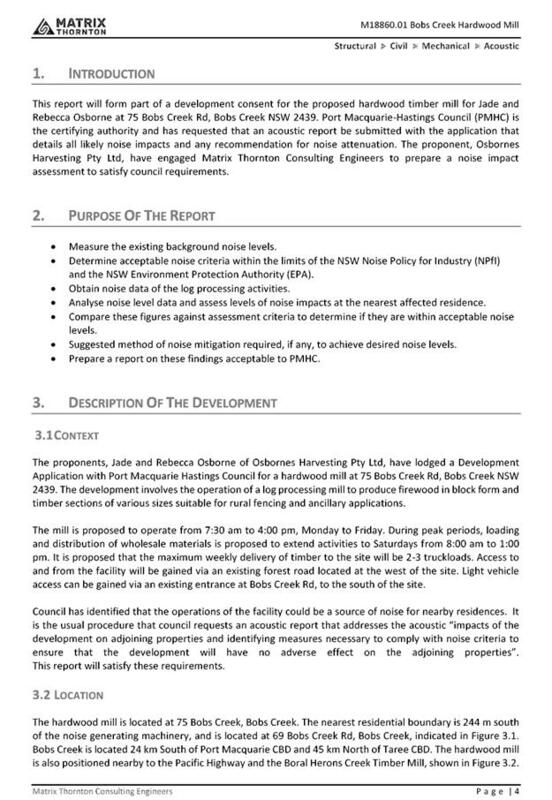 Council will impose conditions to manage noise output. Noted. Conditions of consent will be imposed and compliance action can be taken if this is the case. No screening of the facility. Site inspection revealed that there is existing strands of vegetation that suitably screen the development from surrounding viewpoints. · Noise from the facility is acceptable. 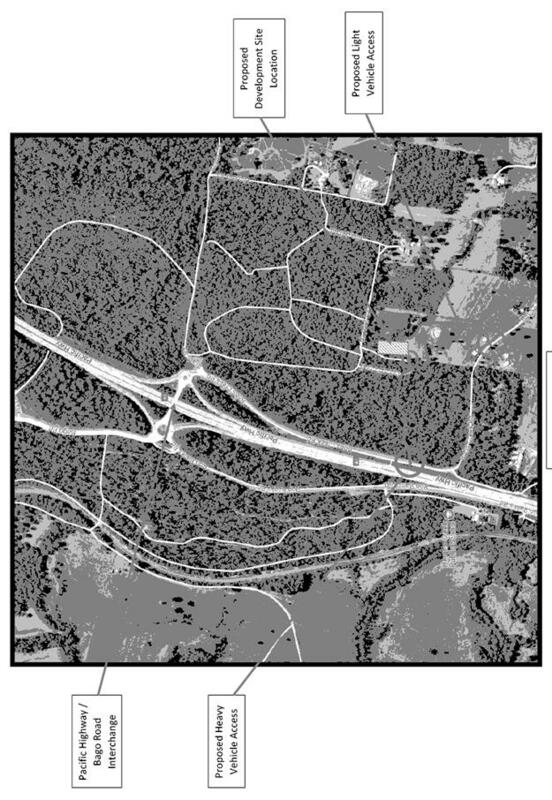 · There are other noise sources in the area that create an impact (ie highway). · Use doesn’t impact on surrounding properties. · The operator is friendly, helpful, community minded and hard working. · Positive contribution to the community. · Facility provides local employment opportunities. · Facility provides easy access to the highway. · The forestry road access will negate a lot of the issues. · There are other uses that could have a worse visual impact. For example, large exempt shed. Not applicable to this application, which does not have any residential or construction component. There is also no reticulated water or sewer available to the site.